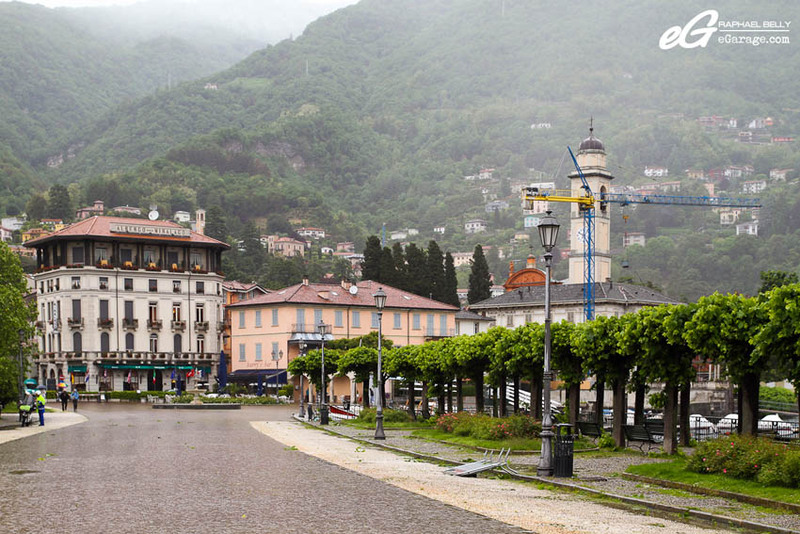 There are some cities in the world like Cernobbio that seem to have been created to enjoy and relax. 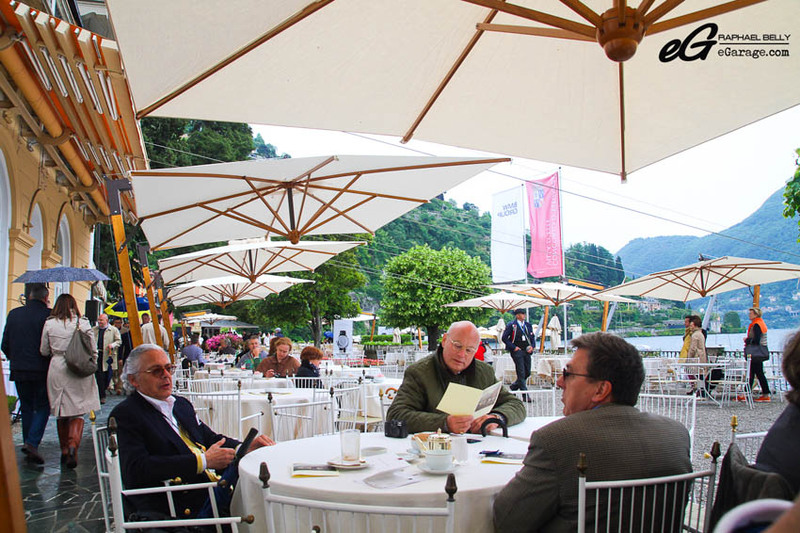 The quietness is disturbed during three days in May with the Concorso d’Eleganza Villa d’Este, taking place this year Saturday 25th and Sunday 26th May 2013. I decided to get to Villa d’Este on Friday early morning because it’s the day dedicated to photoshoots. I was a bit scared about the weather in Italy as it is Monaco where I’m living because it wasn’t very good for the month of May. I was scared because if it’s raining some cars will not leave the deep garage at Villa d’Este where they are sleeping. Just after I crossed the Italian border rain smashed my windscreen while the temperature never stopped lowering. And, after a 4 hour trip, I arrived in Cernobbio at 8:30 AM, it’s 5.5°C, a hard rain, and fog! It’s the kind of weather we have in November! 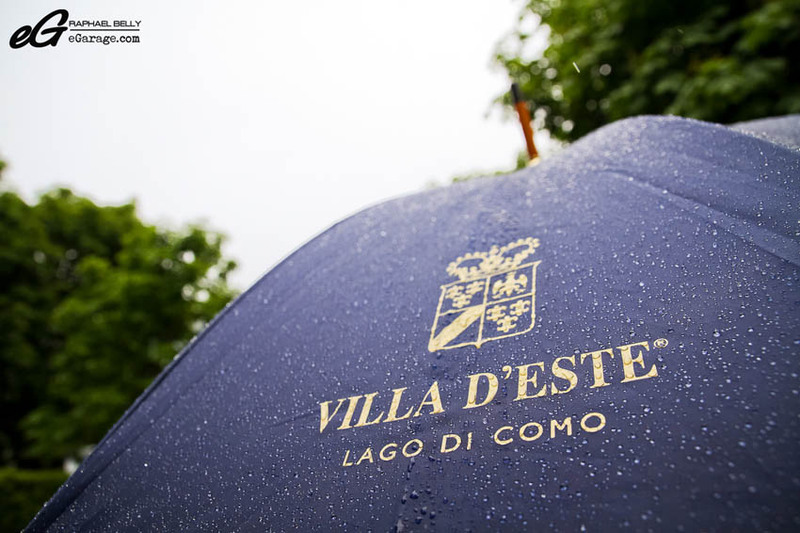 Fortunately the Villa d’Este staff gave me an umbrella and I brought some sweats because I felt the weather will not be good this year. And yeah, I should admit we (people living in the South of France) are a little bit sensitive to the cold. 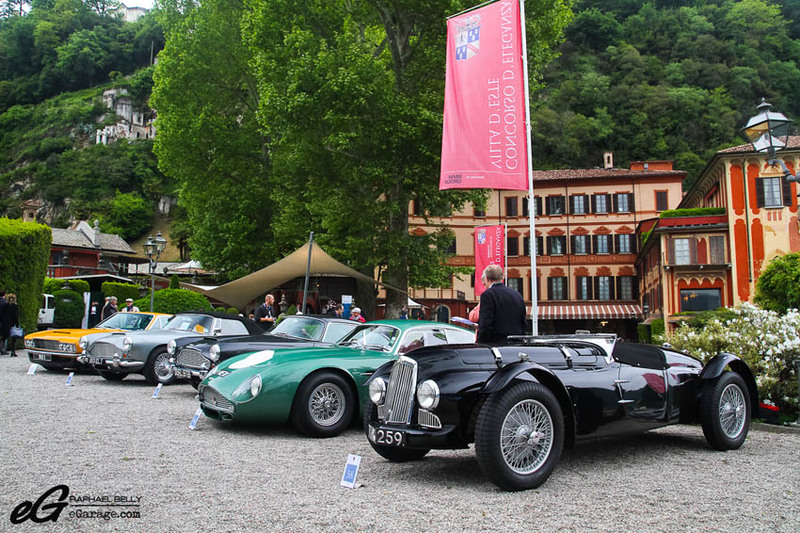 Despite this bad weather, the trucks came to Villa d’Este and delivered its treasures. We did see some cars fighting the cold and the rain and I assure you there were less photoshoots this year because of this bad weather. 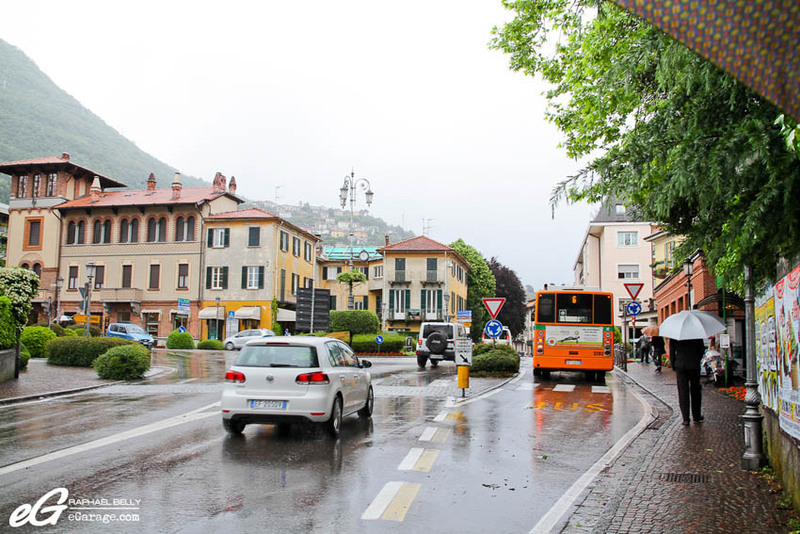 Cernobbio is a municipality in the Province of Como in the Italian region of Lombardy, located about 40 kilometres north of Milan and about 2 kilometers northwest of Como, on the border with Switzerland. 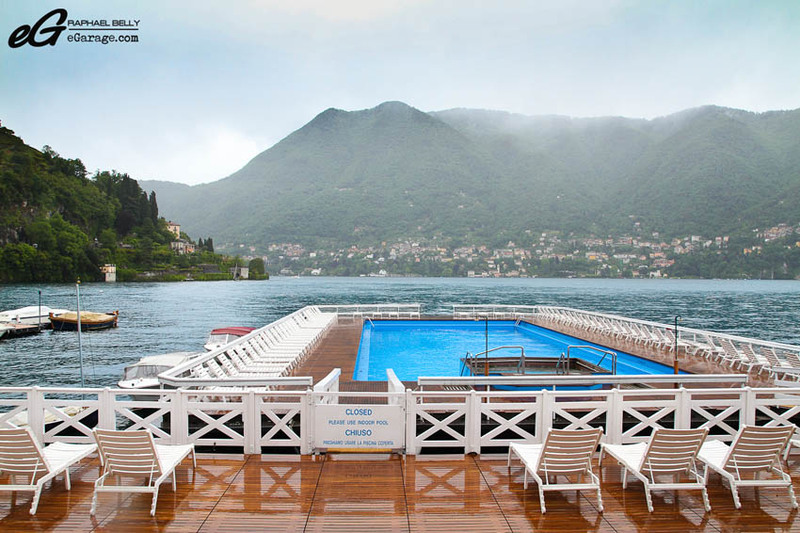 Cernobbio is a well-known international tourist resort accross Lake Como, at the feet of Bisbino Mount. Cernobbio is home to many gorgeous big houses and very famous ones. 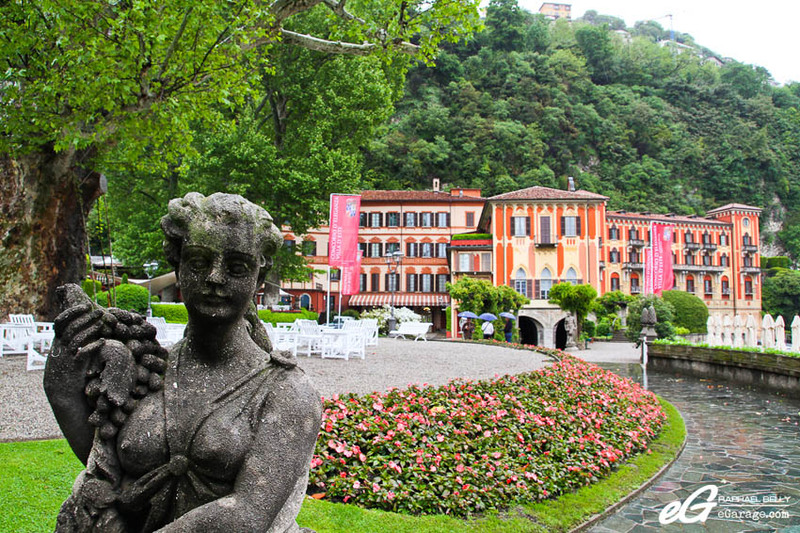 Between these very famous and gorgeous houses, Villa d’Este is the best illustration. 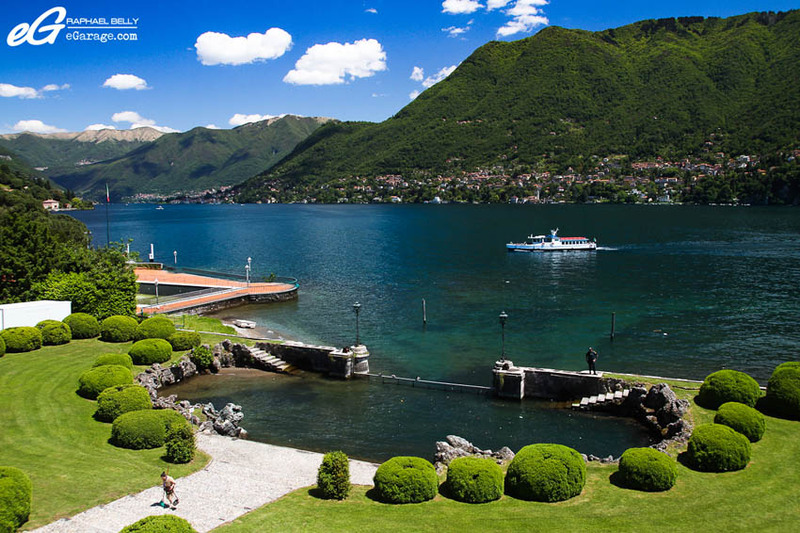 Originally called Villa del Garovo, this amazing house is a Renaissance patrician residence on the shores of Lake Como. 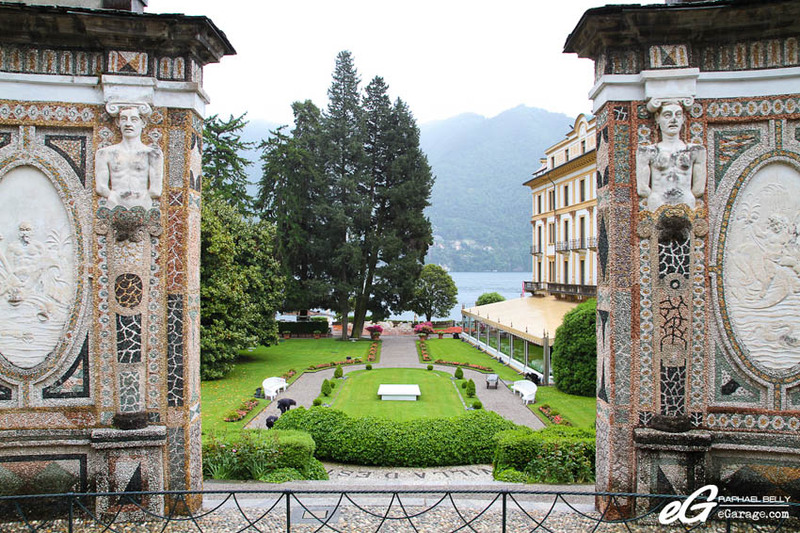 Both the villa and the 100,000 meters square park which surround it, have undergone significant changes since their sixteenth-century origins as a summer residence for the Cardinal of Como. It is the only old garden in Como which keeps more than a fragment of its original architecture. It was the house of the Wales Princess, Caroline of Brunswick during the 16th century. Since 1873, the complex has been turned into a luxury hotel keeping the original style of decoration. Today, with room rates averaging 1400$ a night, and top suites averaging 5000$ per night, the villa is a luxury hotel for wealthy people and a high level congress center. In June 2009, Forbes reckoned it the best hotel in the world. On saturday 25th, the weather was a little bit better. 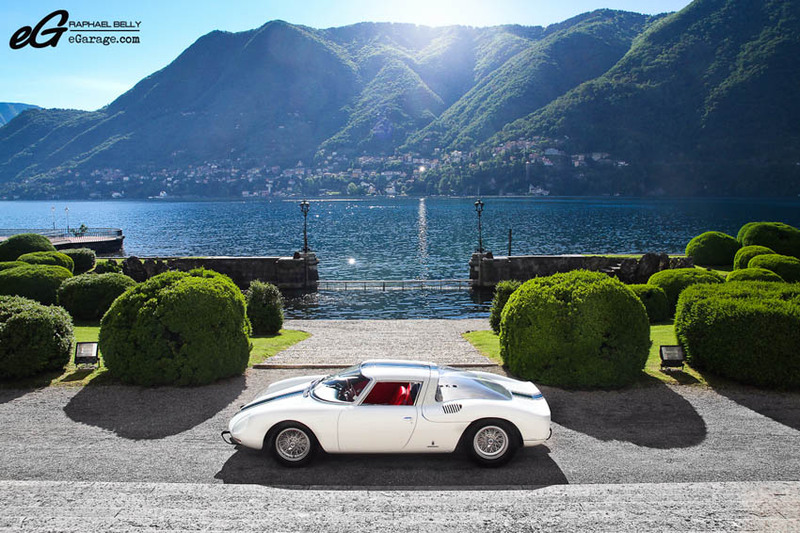 Concorso d’Eleganza Villa d’Este is always overlaying important key dates and car anniversaries, that’s why last year during 2012 Concorso d’Eleganza Villa d’Este there was a special category for the Ferrari 250 as it was the 50th birthday of the legendary Ferrari 250 GTO. 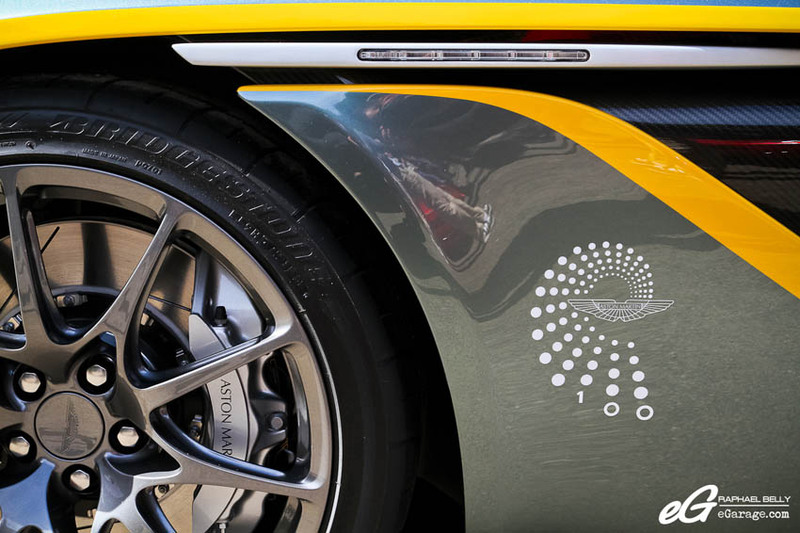 This year, we are celebrating not only one birthday but two, as 2013 is an important year for Aston Martin and Lamborghini. The British brand Aston Martin is celebrating its 100 years of existence while Lamborghini celebrates its 50 years. 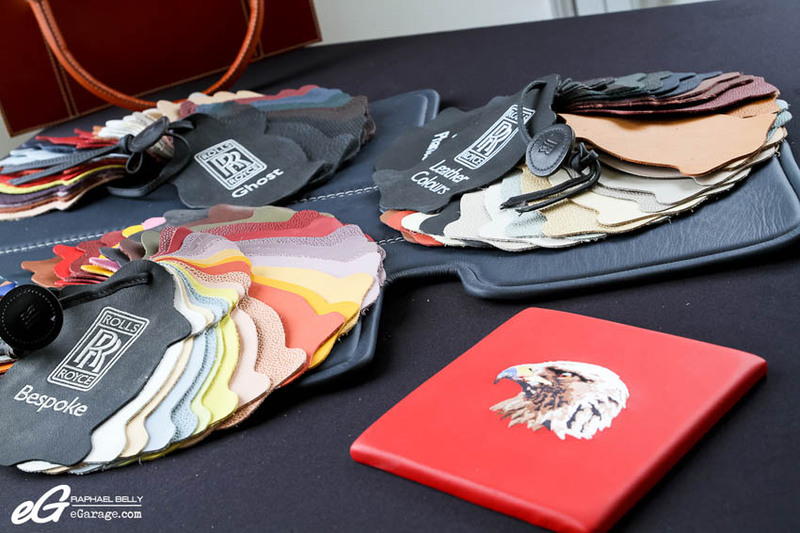 Between the nine classes, Aston Martin and Lamborghini has a special class dedicated to their own brands to illustrate the magnificient cars they made. 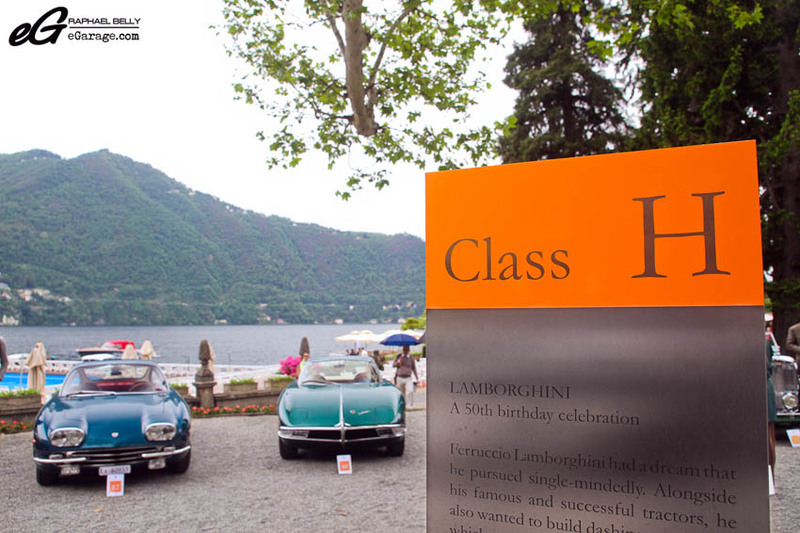 Class H is dedicated to the Italian maestro Lamborghini, with three Lamborghini 350 (one GTS, one GTV, and one GT), one Lamborghini 400 GT, and the diva, the Lamborghini Miura SV. 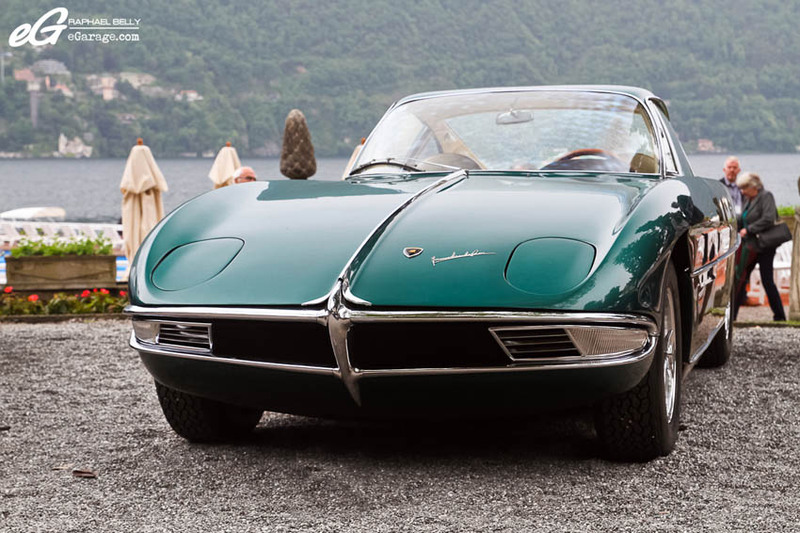 The Lamborghini GTV (for Gran Turismo Veloce) is a concept car unveiled during the 1963 Turin Motorshow. 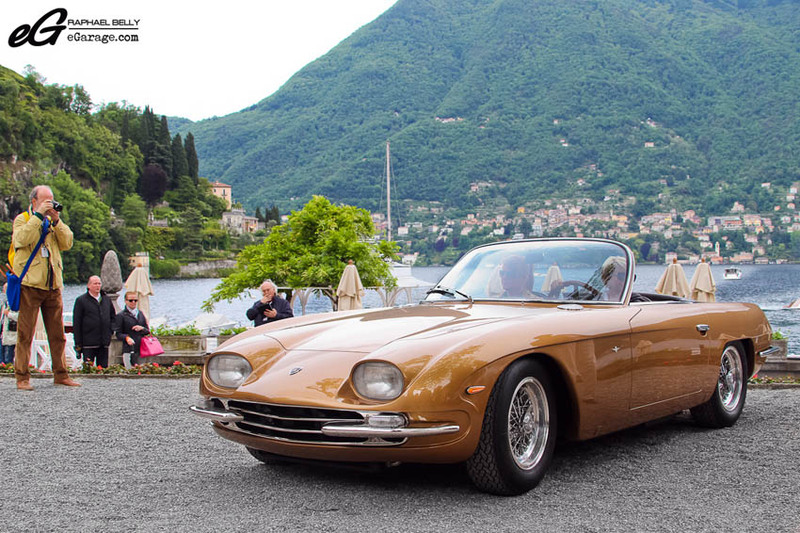 Also shown was this Lamborghini 350 GTS (Gran Turismo Spyder). It is 1 of 2 ever built. 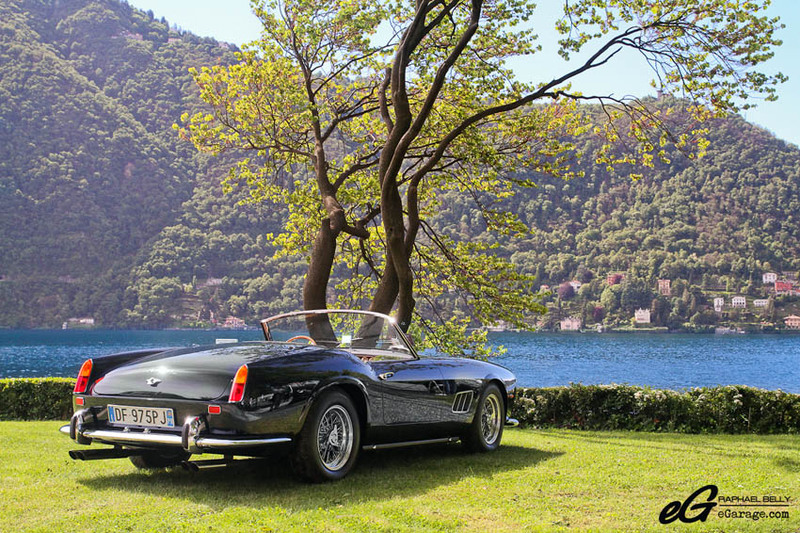 Winner of the H Class dedicated to Lamborghini 100th birthday during this year’s Concorso d’Eleganza Villa d’Este, this 350 GTS was one of only two cars ever built by Carrozzeria Touring (chassis 0325 and 0328). Let’s focus on the British elegance now, expressed through the five cars of Class D, celebrating Aston Martin’s 100 years. 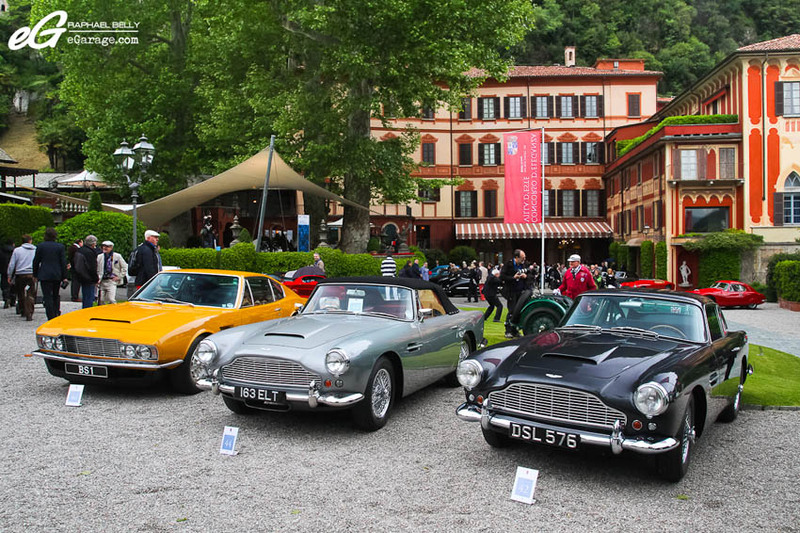 Not one, not two, but three DB4 can be seen in Villa d’Este : a 1962 DB4 Cabriolet (the name Volante came only after the DB5), a 1962 DB4 SS owned by the famous Swiss car collector Jean-Pierre Slavic, and last but not least the iconic DB4 GT Zagato. The two others cars are a 1948 Aston Martin 2-Litre Sports “Spa Replica” and an Aston Martin DBS, not the one of Daniel Craig you have seen in 007 Casino Royale, but the first Aston Martin named DBS, from 1970. 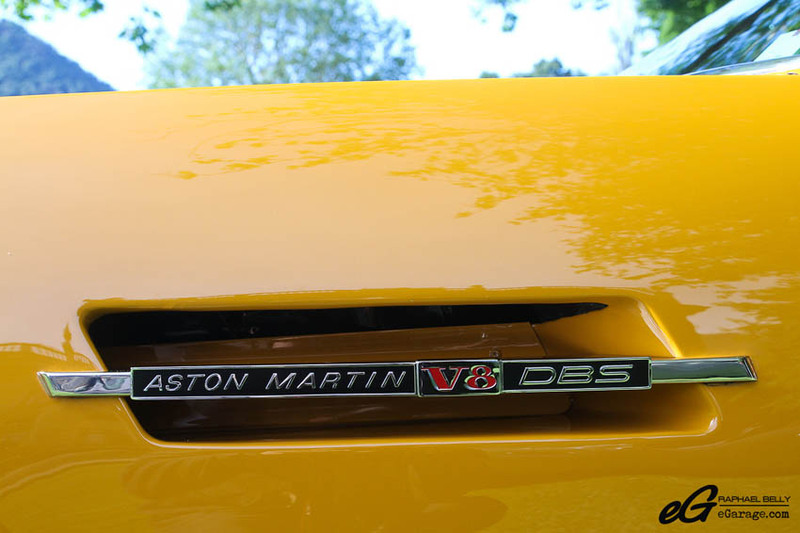 This yellow Aston Martin DBS was used in the short-lived TV series The Persuaders ! 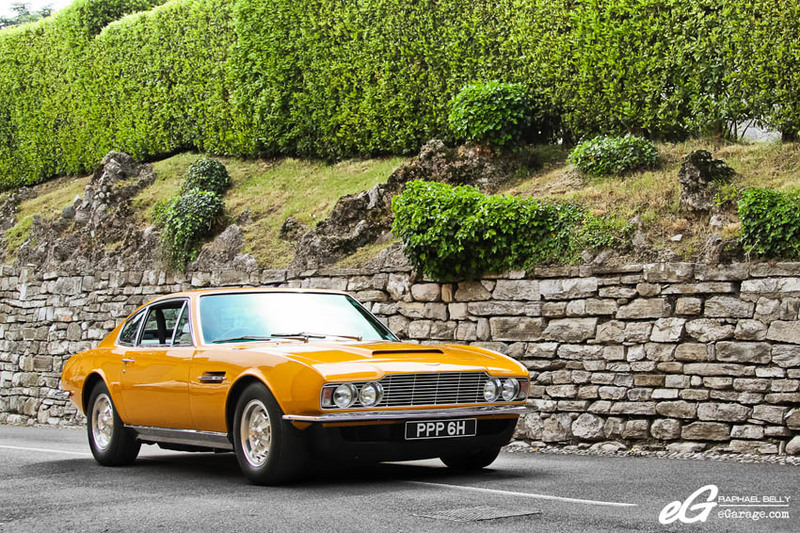 (1971–1972), in which Roger Moore‘s character Lord Brett Sinclair drove a distinctive “Bahama Yellow” (orange/gold) 6-cylinder DBS that, through the use of alloy wheels and different badges, had been made to look like the DBS V8 model. 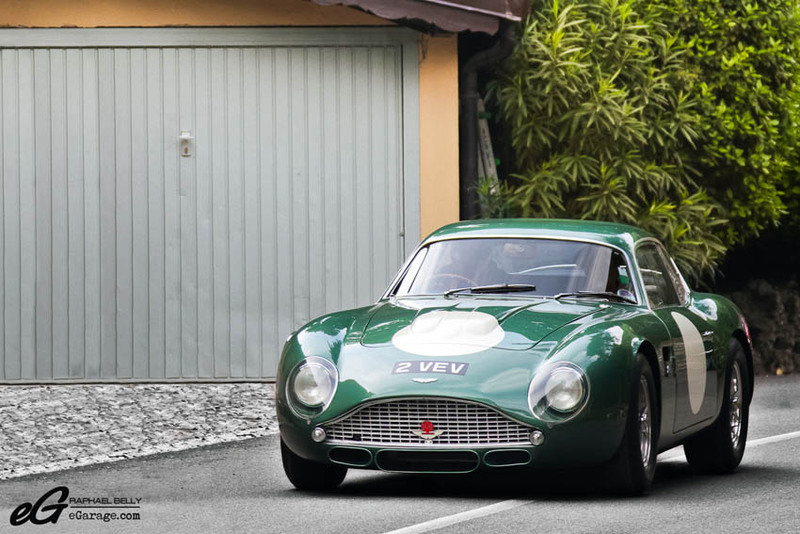 The Swiss car collector Jean-Pierre Slavic and his 1962 DB4 SS was the Aston Martin Class winner whereas the iconic Aston Martin DB4 GT Zagato received the Mention of Honour by the Concorso d’Eleganza Villa d’Este jury. 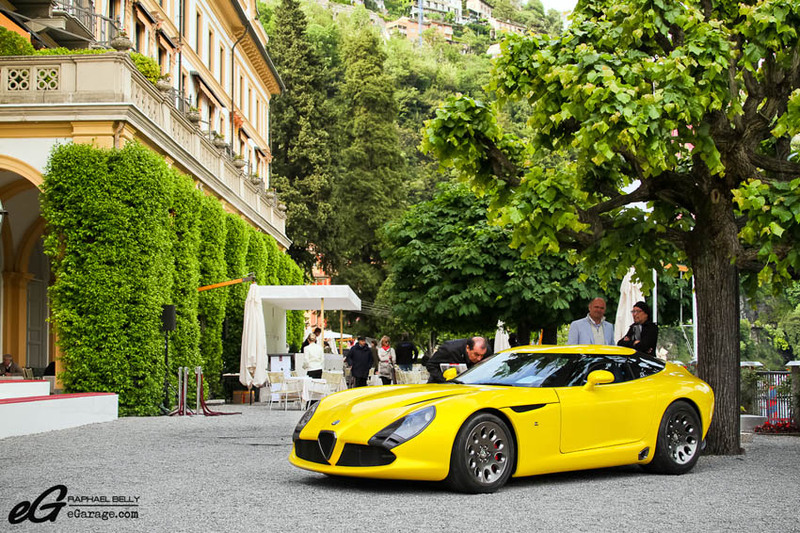 Before the car’s parade, make sure you get a seat outside the Villa d’Este restaurant. A good opportunity for you to relax and to watch the cars driving in front of you. 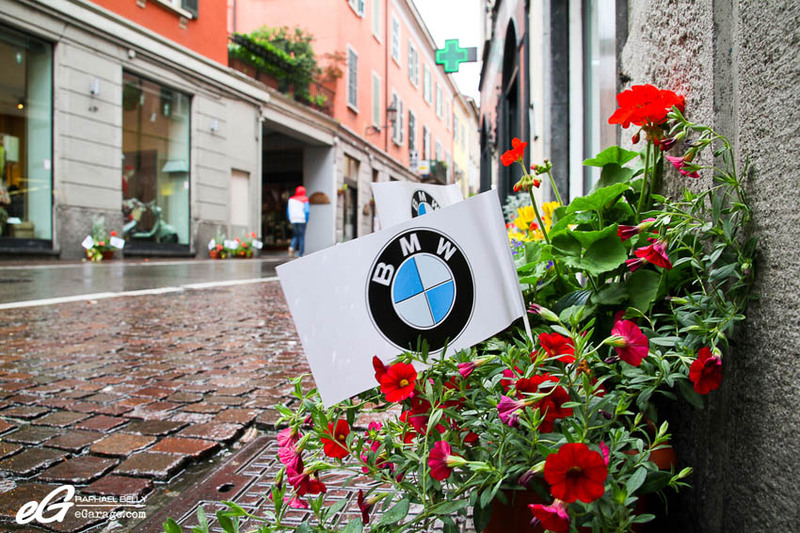 Moreover, thanks to the press accreditation kindly granted by the very nice and welcoming BMW Group team, you have a free ticket to lunch at the restaurant. And what a restaurant! 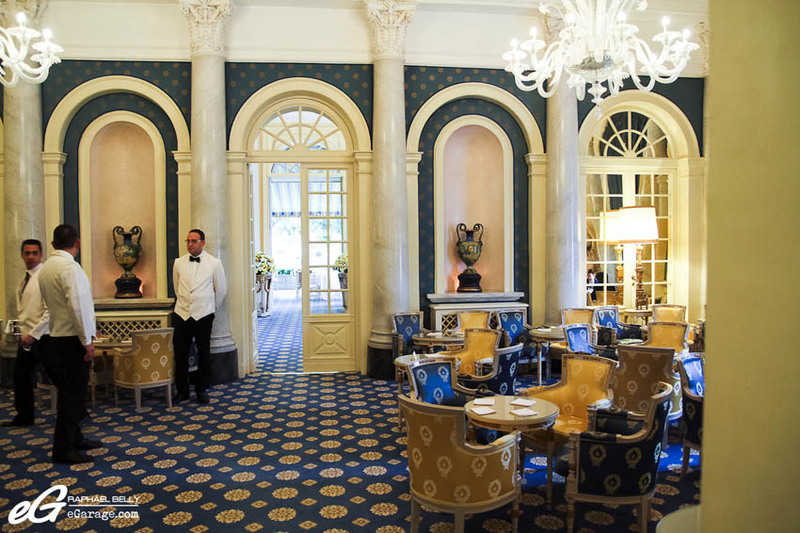 Dining at Villa d’Este is “A Moveable Feast”. I’ll go for a club sandwich. 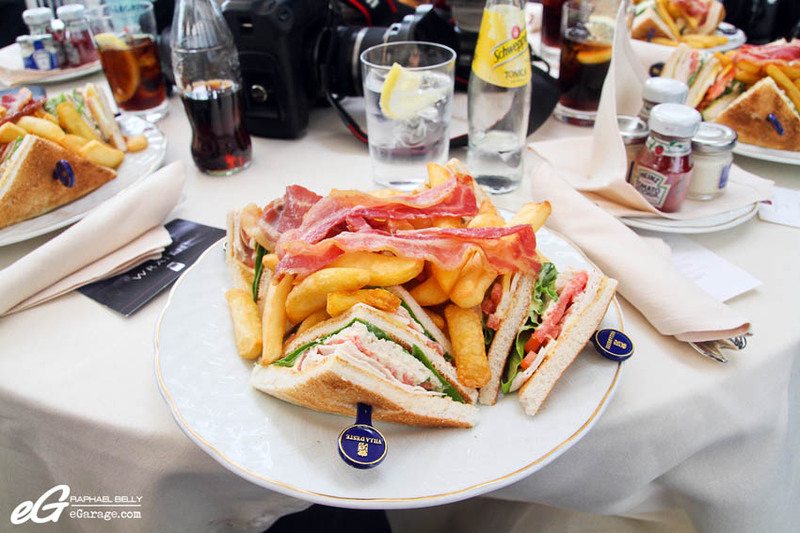 Sorry, I mean THE club sandwich because at 30€ (!!!) on the menu there’s no doubt it is an institution. But I have to say it’s delicious. In addition, if you have in mind the place where you are eating (at the restaurant of one of the best hotel in the world), in front of a lake while millions of dollars in cars are driven in front of you, we can say it’s not as expensive as you first think when you’re looking at the price on the menu. While you’re enjoying your club sandwich, I highly recommend you to listen to Simon Kidston’s comments when the cars parade. 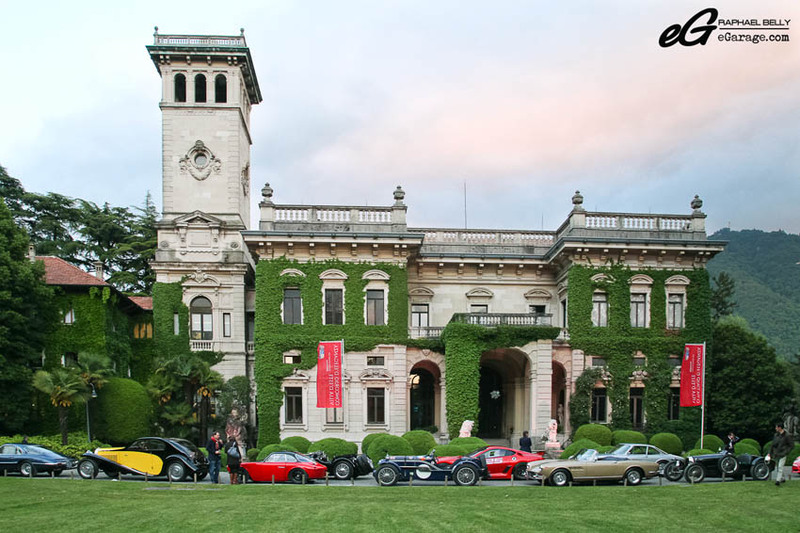 Simon Kidston is the famous Concorso d’Eleganza Villa d’Este speaker and a luxury car trader. The English-born Swiss national, educated in Italy and Switzerland, is the archetypal gentleman. He’s a living book on each car and each time a car come in front of the jury desk there is no doubt you’ll learn useful things and hear many nice stories. Just after the main Villa d’Este entrance, Rolls Royce was displaying the brand new Wraith. We were kindly welcomed by Rolls Royce staff to discover it. What we can tell you is that it has nothing to do with a Ghost Coupe, it is a unique car with a very sporty Fastback body. You know eGarage likes to see and share what’s behind the cars, the people in the back that we don’t see. To go further with the explanation, we went to the private Rolls Royce Lounge held in a really charming villa in front of Lake Como to discover in detail the Rolls Royce Bespoke programme. 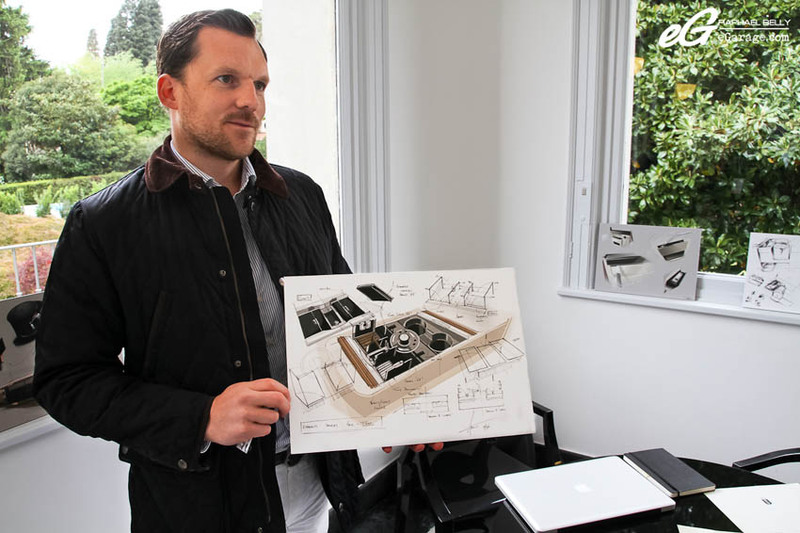 And this is what we felt speaking with Alex Innes (designer at Bespoke Programme in Goodwood) in Rolls Royce Lounge. Alex said that as long as the client doesn’t want to change the fundamental design of the car, the possibilites are infinite. The extent of the personalization and the level the work goes to is astounding. To sum up, you can personalize the personalized. Absolutely stunning. 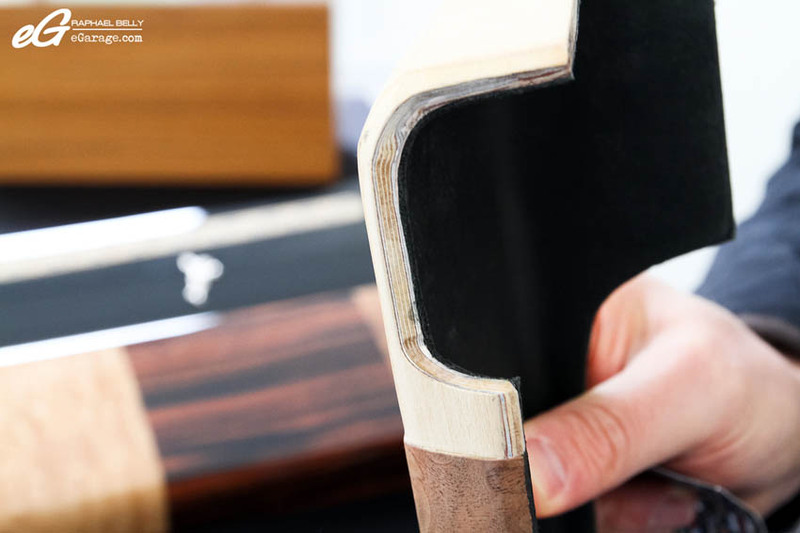 How’s this for bespoke – the doors are made by many sheets of wood and aluminium to be lighter, and those unique leather colors – maybe you want your car to match your favorite shirt? 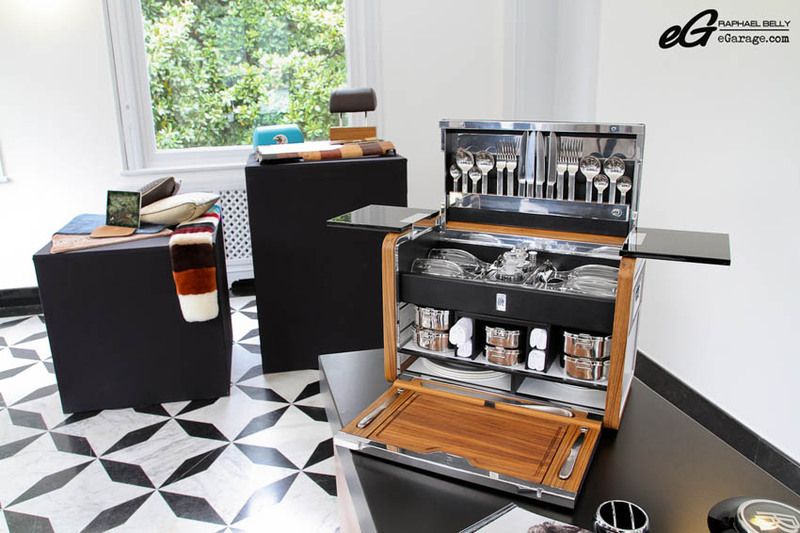 We saw some non-standard projects like one with a client that wanted a cigar humidor in the central console, another where the customer asked to have an automatic watch winder humidor in the central console too. We asked which country asked for the most craziest colors and there was no surprise that they answered us with the Middle-East, America, and the Asian market. Regarding the Asian market, Rolls Royce was displaying a special edition of the Ghost especially made for 2013 Shangai motorshow called the Ghost Alpine Trial Centenary Edition. 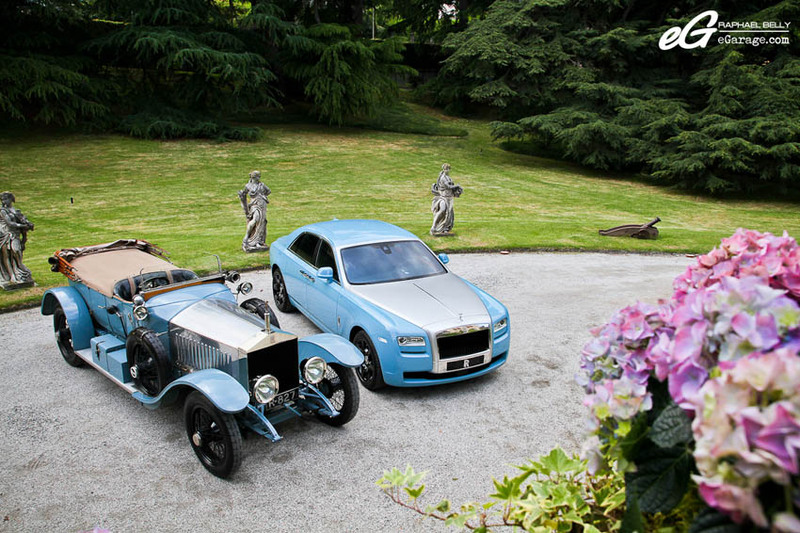 A turquoise blue Ghost with black rims celebrating 100 years of a key event in Rolls Royce history : the 1913 Alpine Trial. This 2013 Ghost is paying tribute to a Rolls Royce Silver Ghost from 1913 that traversed over 1,800 miles of Alpine roads without almost any problems, that’s why it earned the moniker ‘The Best Car in the World’, cementing the brand’s reputation for engineering excellence and impeachable reliability. After really bad weather on friday (5°C with rain and fog! 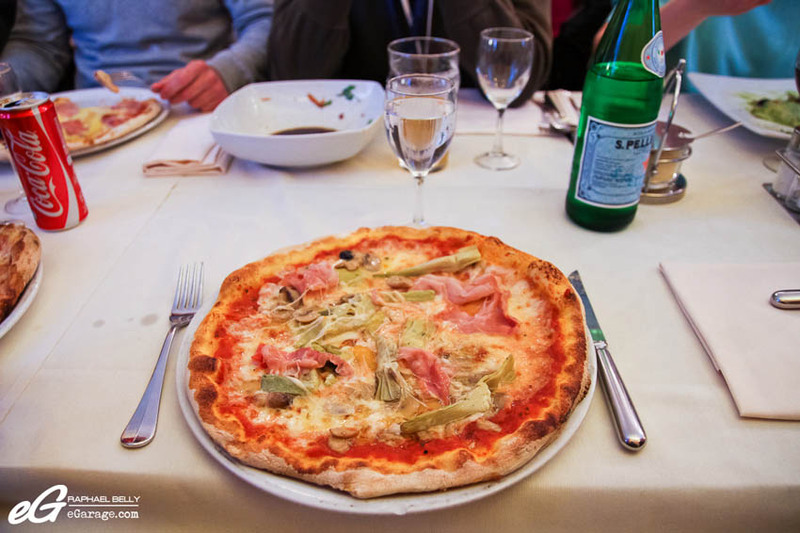 ), it was time for me to have a great typical Italian diner in Cernobbio. 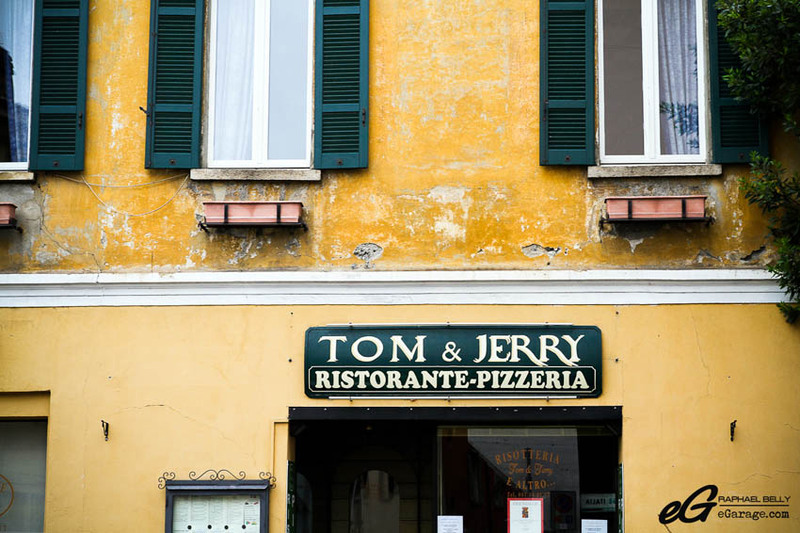 I highly recommend Tom & Jerry restaurant, quite small but very affordable and with a wide choice of pizza and pasta, a 5 minute walk from Villa d’Este main entrance. 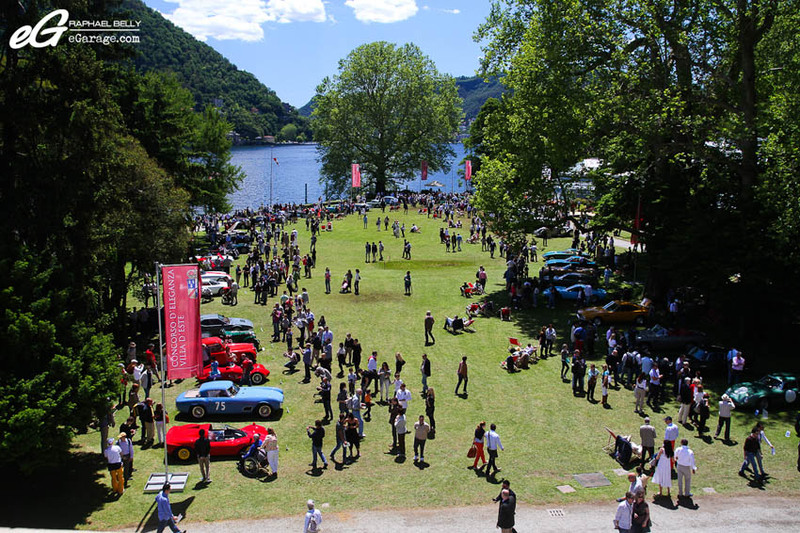 Sunny weather was back on sunday 26th so all the cars and trucks could successfully be transfered from Villa d’Este to Villa Erba (750 meters distance). 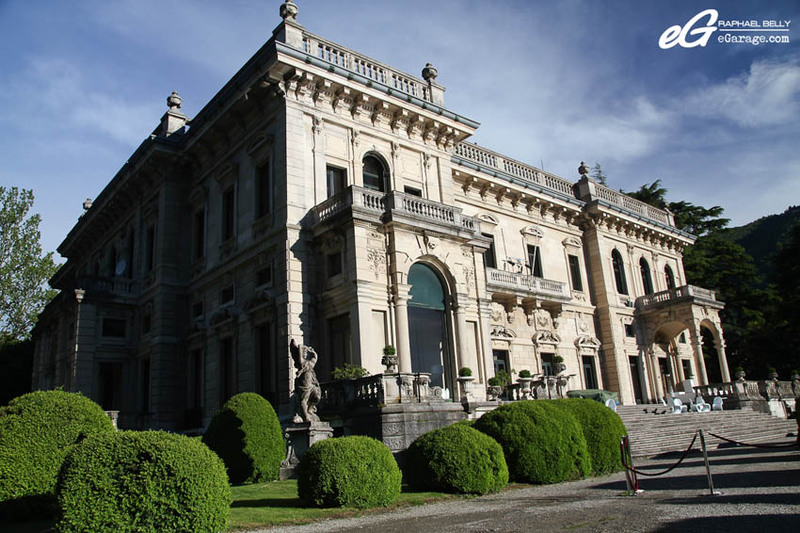 The Villa Erba is a palace of classic style of the XIXth century near the Villa of Este, in front of Lake Como. The Villa goes back to the XVth century in the form of a convent with about 25 nuns from the order Benedictine of Cluny. In 1882 the property was bought by countess Anna Brivio and her husband Luigi Erba (brother and heir of the pharmaceutical industry CEO Carlo Erba). In 1897 the new Villa is built. The Erba family is famous for having luxurious receptions for important guests, artists and famous people from the political and industrial world. 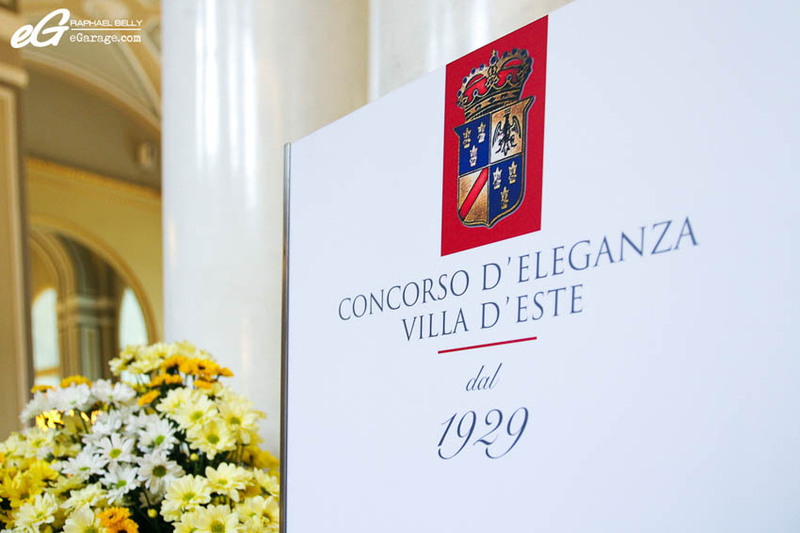 In 1922, their daughter Carla Erba inherited the property and married Duke Giuseppe Visconti of Modrone. 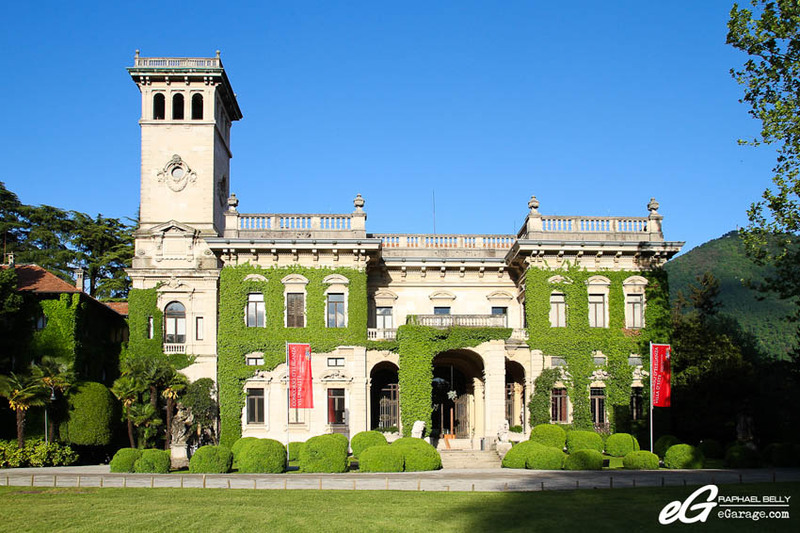 In 1986, the heirs from the family Visconti sold the villa and the important domain adjoining a public consortium which made it an important international center of exhibition and conference. Here is the Villa Erba legend. 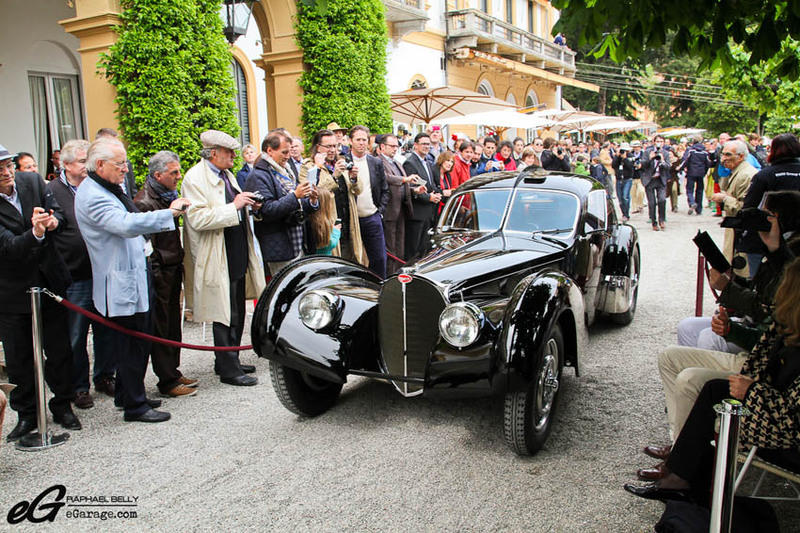 Speaking about legends, we have a lot of legendary and expensive collector cars each year at the Concorso d’Eleganza Villa d’Este. 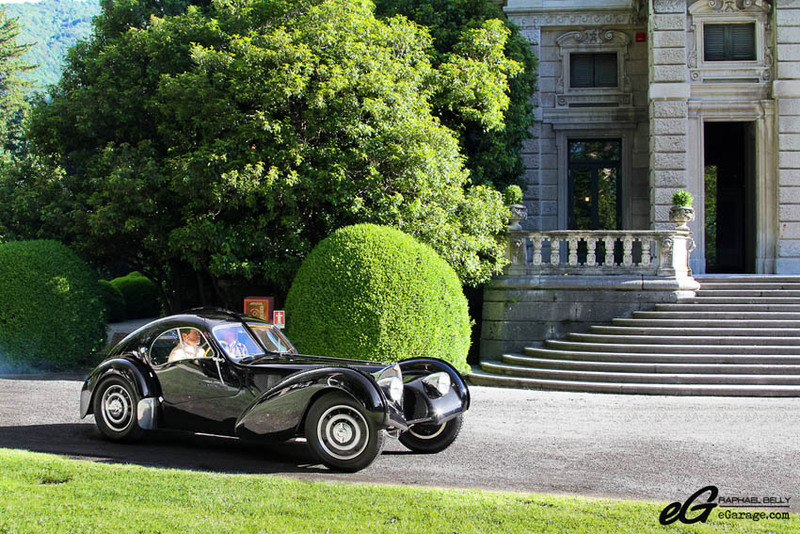 This year’s Concorso d’Eleganza Villa d’Este is proud to welcome Mr. Ralph Lauren and his marvelous, gorgeous, magnificient, Bugatti Type 57SC Atlantic (SC for Super Charged and Atlantic to pay tribute to Jean Mermoz, a French airman, friend of Jean Bugatti who died somewhere over the Atlantic sea in 1936). 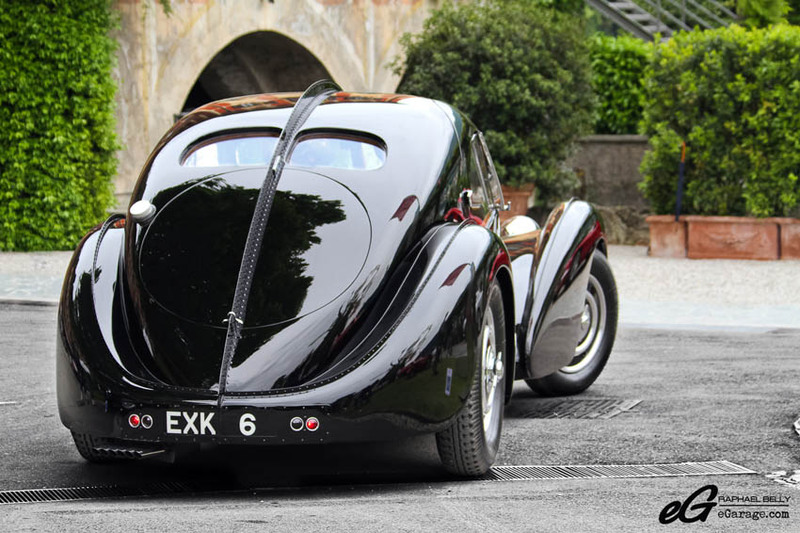 This car, sorry, this masterpiece, is considered a myth in the automotive history for its rarity (only three were made), its 200HP supercharged 8 cylinder engine and 200 KPH top speed – very strong power for a 1938 car, and an impressive and classic design (a teardrop aluminum body). 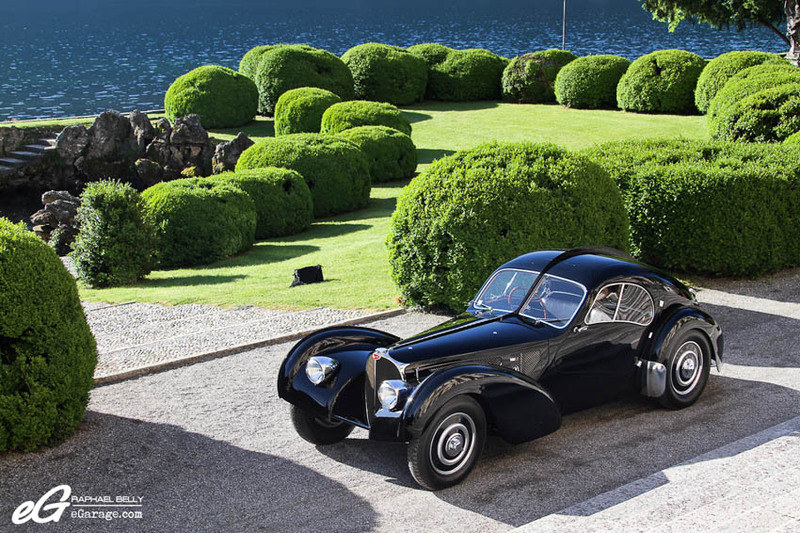 Ralph Lauren’s Atlantic is chassis #57591, the last Atlantic made. 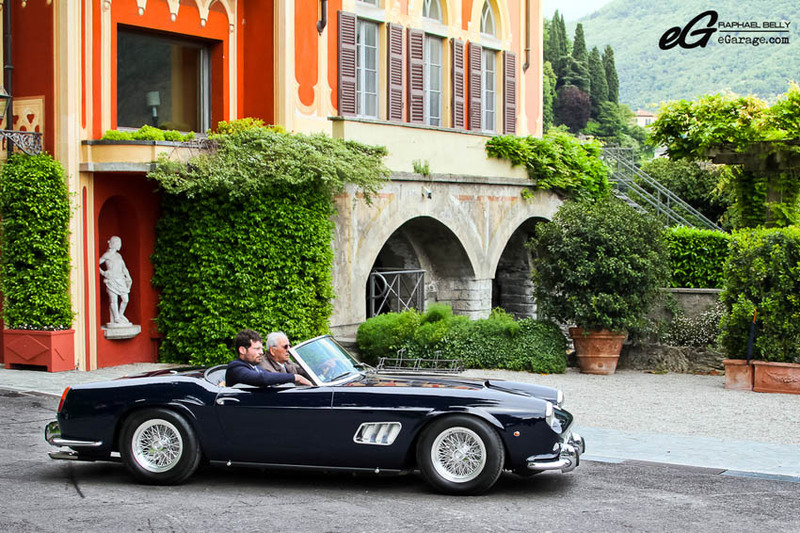 We had the opportunity to take pictures of this jewel in front of Villa Erba. 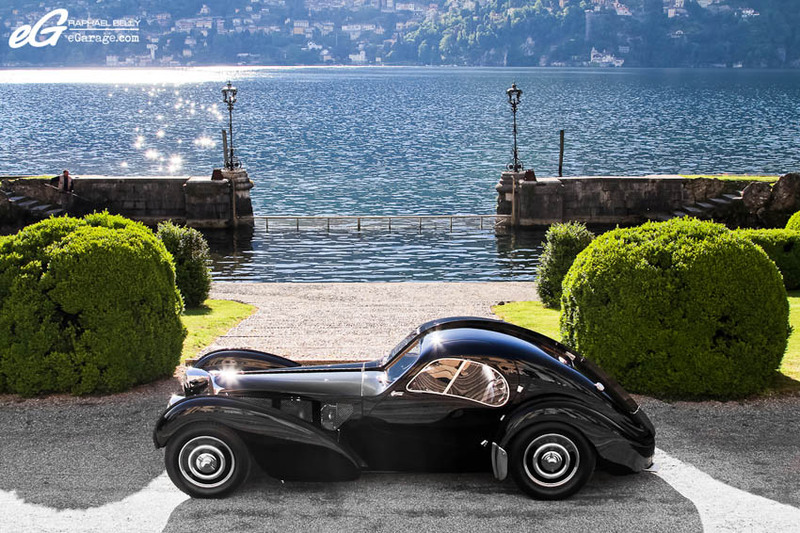 Please note you’re in front of the world’s most valuable car ever built – Ralph Lauren’s Bugatti Type 57SC Atlantic is estimated between 40,000,000$ and 60,000,000$ !!! 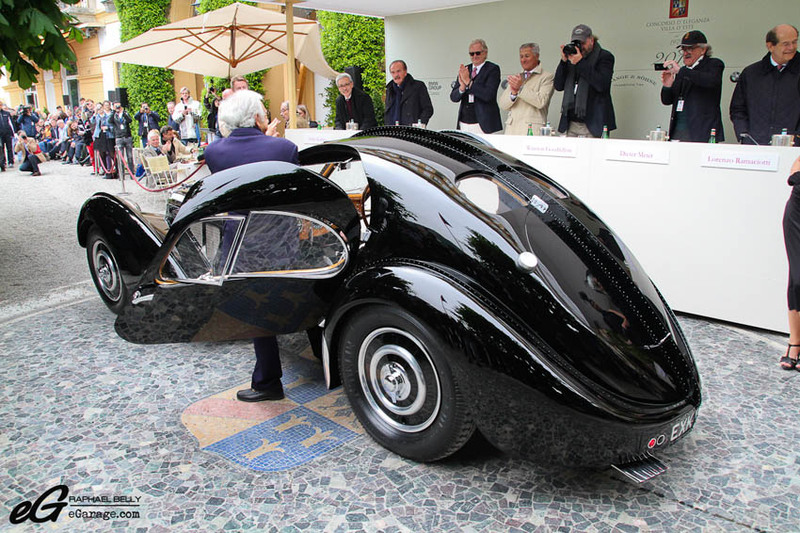 In 2010, Bugatti Type 57SC Atlantique Chassis #57374 (the first made) set a new record during a Santa Monica auction (Gooding & Co). The firm did not officially release a sale price, although people close to the transaction said the Bugatti had gone for between 30,000,000$ and 40,000,000$! Consequently the Concorso d’Eleganza Villa d’Este jury and public couldn’t resist in front of the Ralph Lauren’s Atlantic beauty and literaly melted on this car as it won the four main prizes : the Trofeo BMW Group for “Best of Show” (prize decided by jury on Saturday 25th in Villa d’Este), the Coppa d’Oro Villa d’Este for “Best of Show” (prize decided by public referendum on Saturday 25th in Villa d’Este), the Trofeo BMW Group Italia for “Best of Show” (prize decided by public referendum on Sunday 26th in Villa Erba), and Trofeo BMW Group Ragazzi for “Best of Show” (prize decided by public referendum – under the age of 16 – on Sunday 26th in Villa Erba). 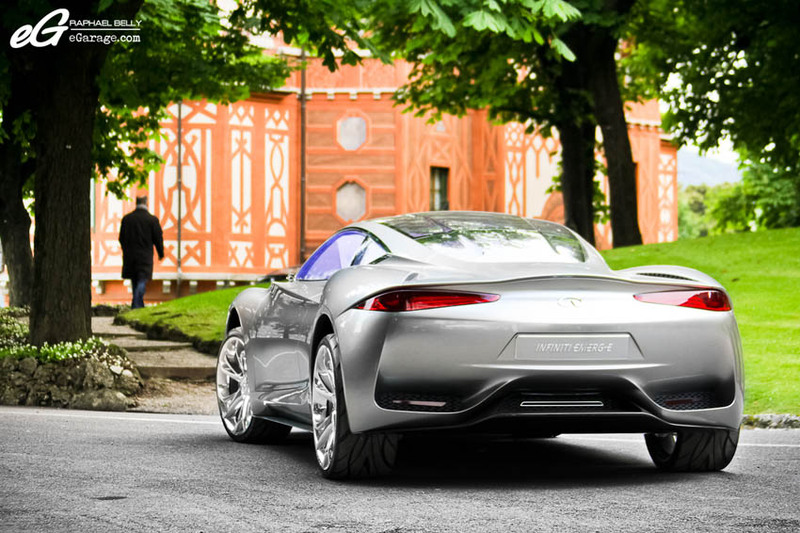 The cherry on top – it also won the Trofeo Auto & Design (for the most exciting design by the Jury). 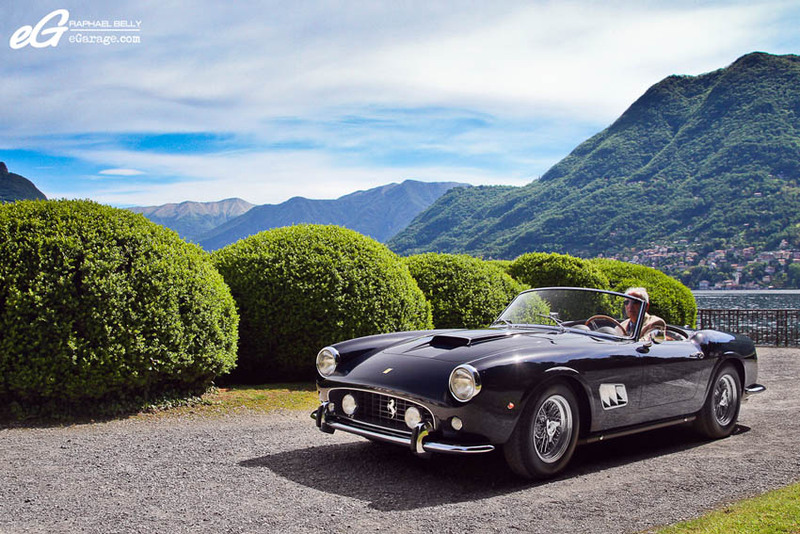 Another jewel I’d like to focus on is the Ferrari 250 GT California Spyder SWB (Short Wheel Base). 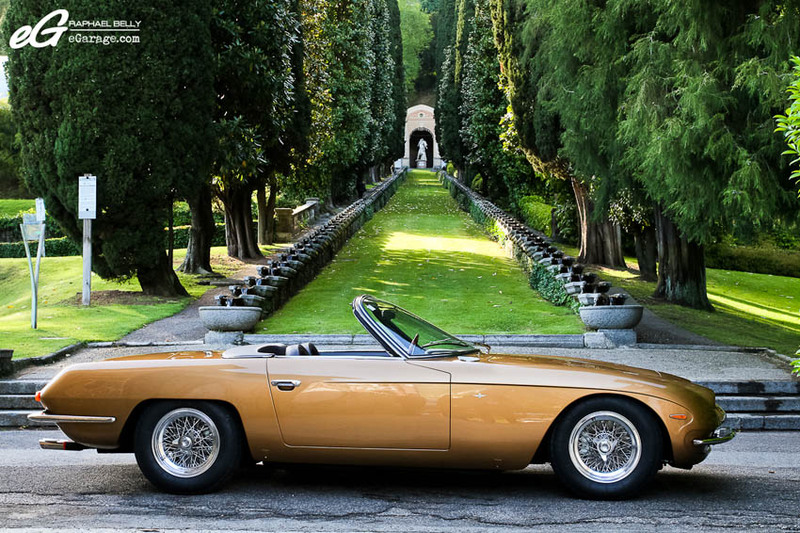 This 1959 PininFarina designed is considered as one of the most beautiful Ferraris and one of the most beautiful convertibles ever made in the automotive industry. Power was the king of the Ferrari engines (a 3L V12). Only 75 California were made. Elegant design, a V12 engine, few units, the myth was born and the value has never stopped rising. 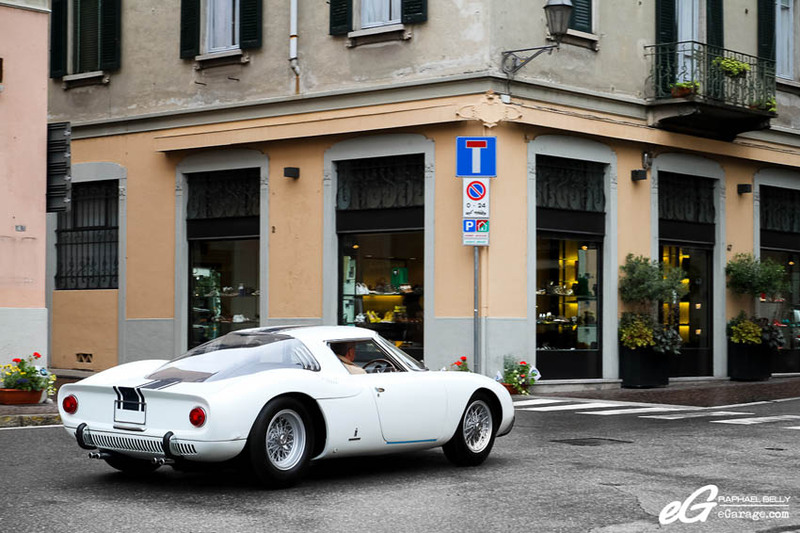 Ferrari 250 series is the biggest part of the Italian brand, and this year your eyes can also fall in love with a special 250 : the unique Ferrari 250 LM Stradale Speciale. Stradale because it’s a road legal version of a racing car, and Speciale because it is a one-off. Only thirty-two 250 LM were constructed in 1964 to race in Le Mans, and it was never homologated as a GT car. 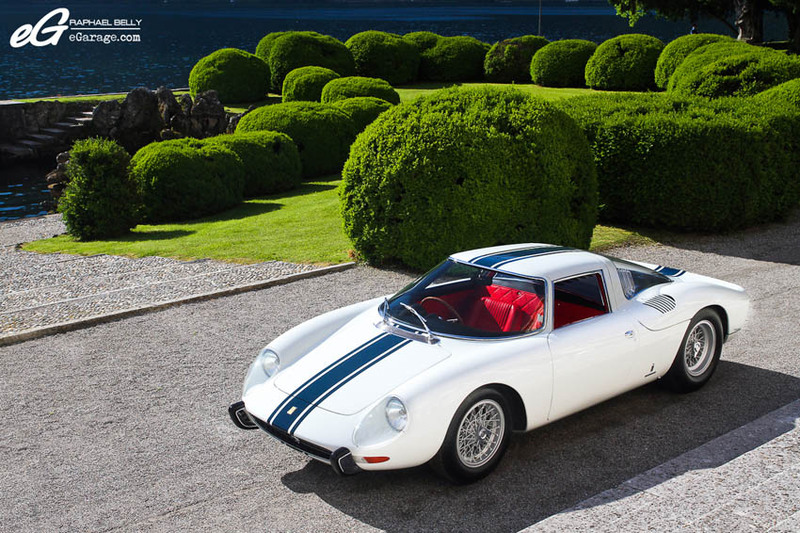 The 250 LM Stradale Speciale debuted the 250 LM Stradale at the 1965 Geneva Motorshow. 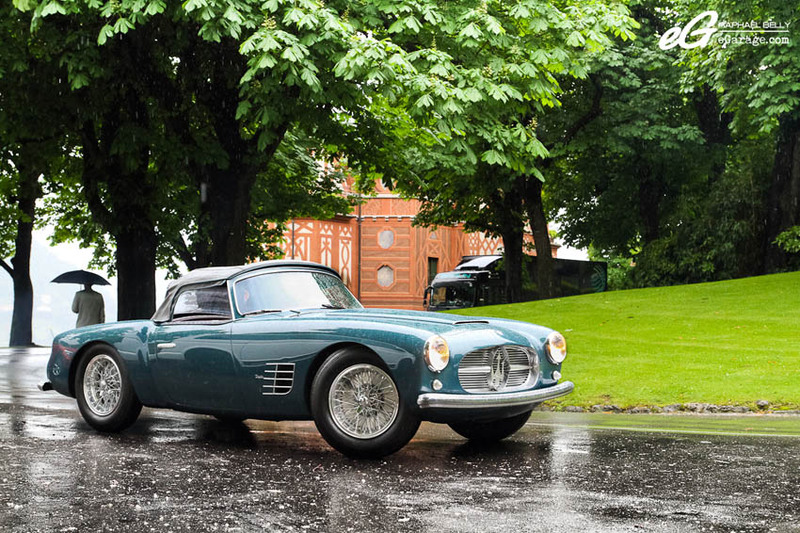 What I love most at the Concorso d’Eleganza Villa d’Este is that this is a beautiful mix of modernism and classicism so you can see jewels of the past, like the Bugatti Atlantic or the Ferrari California and LM we spoke about above, and modern cars through the Concept Cars & Prototypes category. 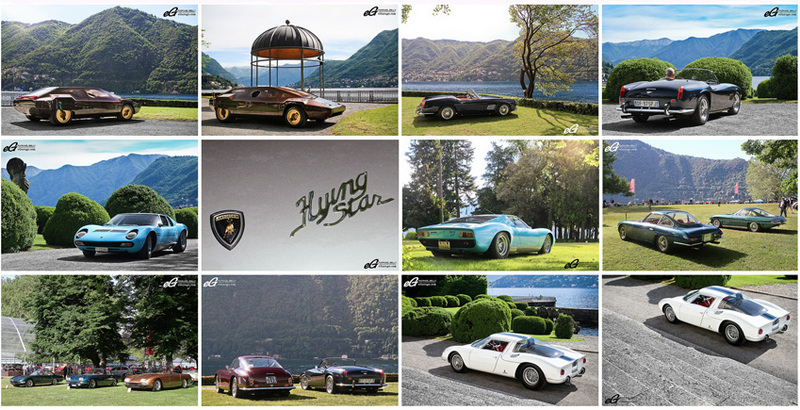 Like the seven marvels of the world, this year seven concept cars hit the ground of Concorso d’Eleganza Villa d’Este. 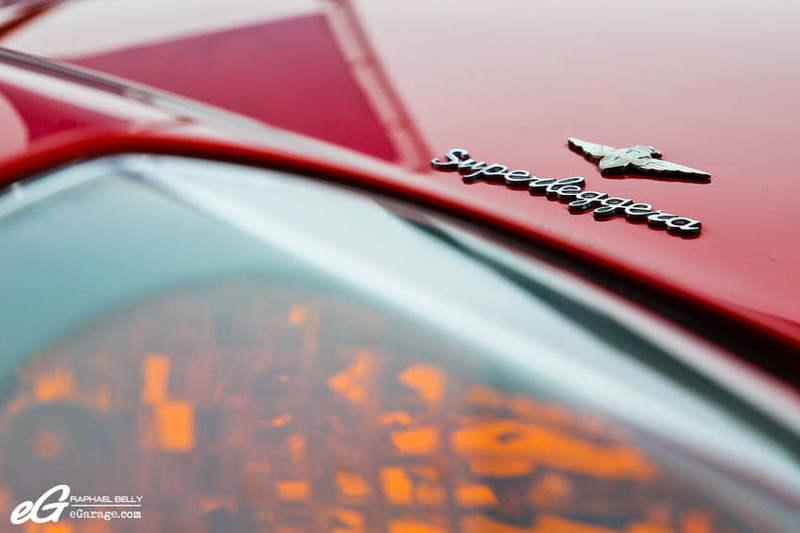 Three of these marvels come from Italy (Alfa Romeo TZ3 Zagato Stradale, Alfa Romeo Disco Volante by Touring Superleggera, Pininfarina Sergio). 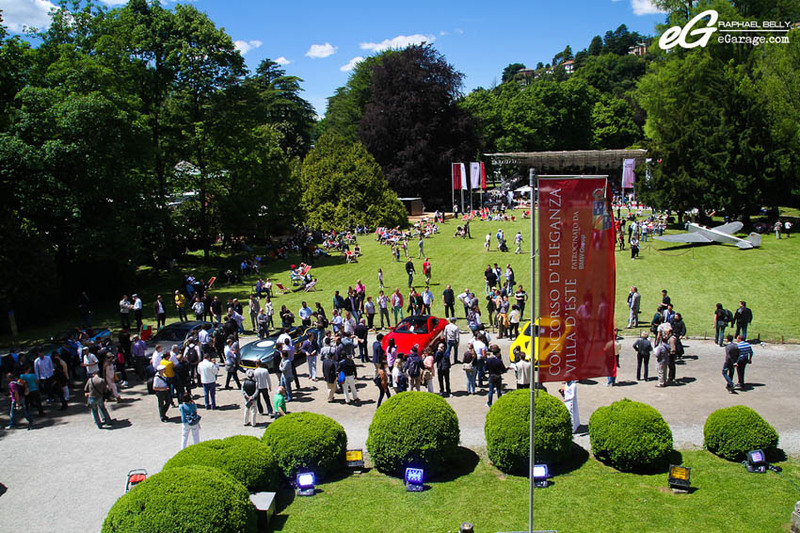 By Public Referendum at Villa Erba (on sunday 26th), Concorso d’Eleganza Design Award for Concept Cars & Prototypes was won by the Touring Superleggera Alfa Romeo Disco Volante. This car is a reinterpretation and a tribute to the 1952 Alfa Romeo C52 Disco Volante Spider, considered as one of the most original stylistic Alfa Romeo built. 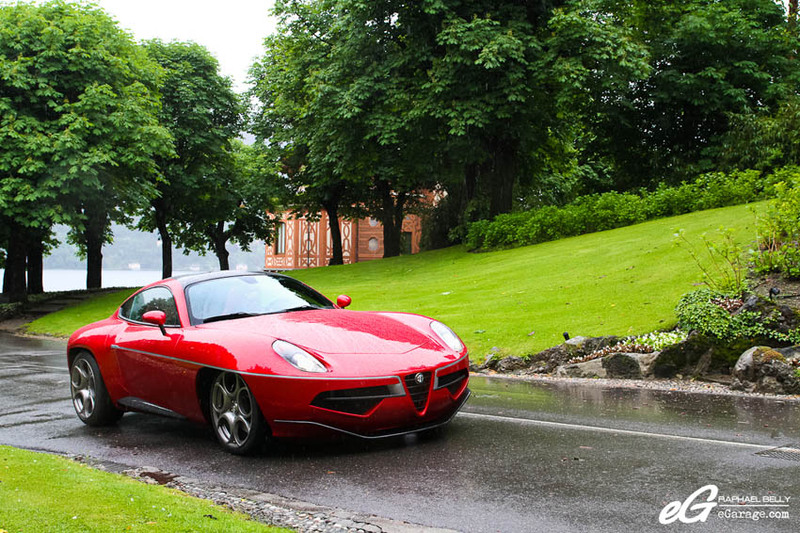 The 2013 Disco Volante is an Alfa Romeo 8C basis (chassis and engine), which body has been totally turned new by the Carrozzeria Touring only on request : if you are a 8C owner you can turn your 8C Competizione in a Disco Volante by asking Carrozzeria Touring. After 4000 hours of manual and precise work the Disco Volante will be yours. 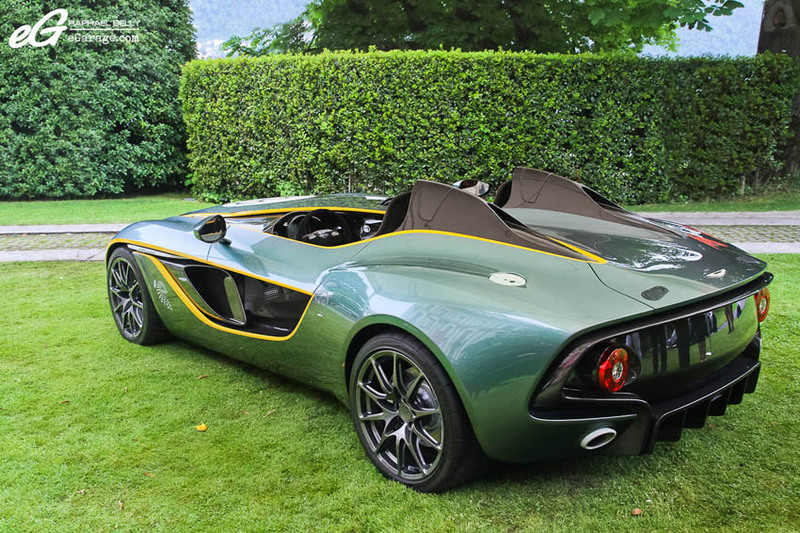 To celebrate Aston Martin centenary, the British brand came with a really delicious birthday cake at Concorso d’Eleganza Villa d’Este 2013 : as well as a really nice car named CC100 (Concept Car 100), directly inspired from the DBR1. This concept is reflecting the sporting heritage and exceptional design capability woven throughout 100 years of Aston Martin history. I have to say I really like it (and believe me I’m difficult when it comes to modern cars!). It’s a modern car but it reminds a lot of an old car (the DBR1) as it’s a Speedster like there were a lot in the past, and at the same time it takes a lot of parts of the DBR1 again (deep green and yellow contours parts). At the time we’re writing, Aston Martin is saying it is just a Concept, so we’ll have to wait to see if it’ll be produced but we really hope it will. There is no doubt that a lot of buyers will show interest in this beautiful car. 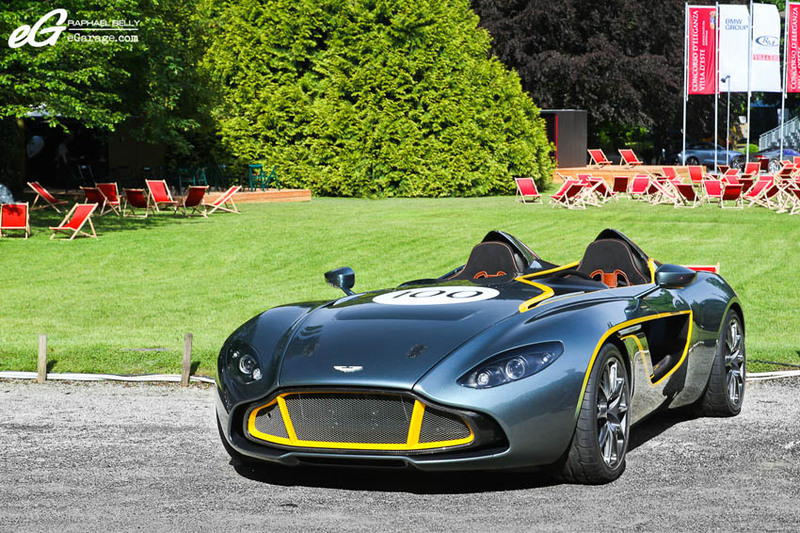 What we can say for sure is Happy Birthday Aston Martin, Happy 100th Birthday to you! BMW Group (the Concorso d’Eleganza Villa d’Este Organising Committee) unveiled for the very first time the BMW Gran Lusso Coupé Pininfarina, an elegant 2+2 coupe. This is the very first time that BMW and Pininfarina are working together. 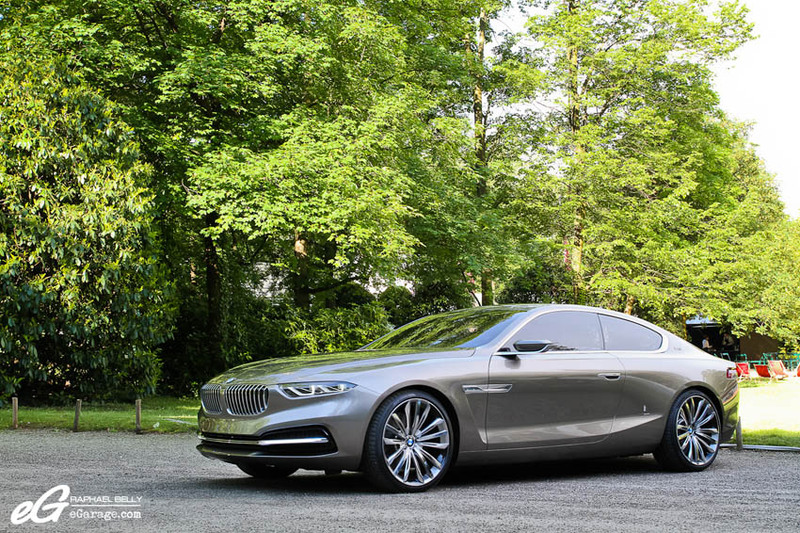 The basis is a 7 Series V12 but BMW refuses to speak about a possible production, but it will clearly inspire the german brand for its future cars. 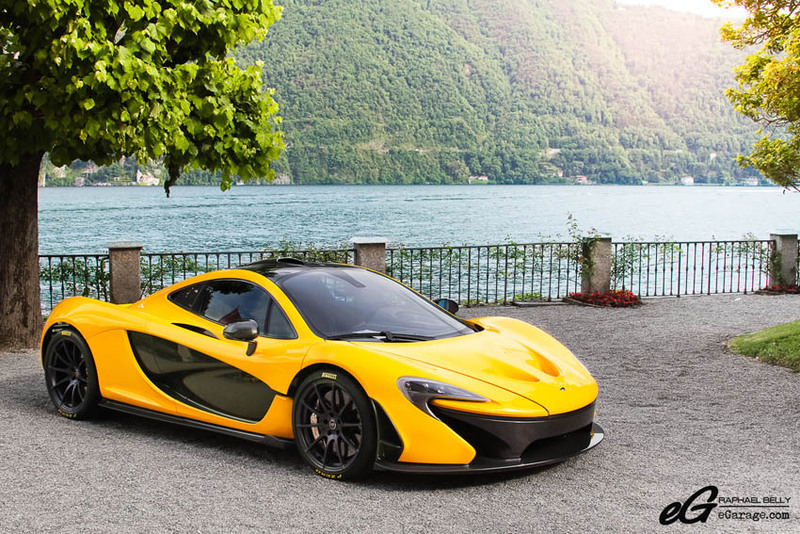 McLaren proudly brought and diplayed their last Supercar, the P1. 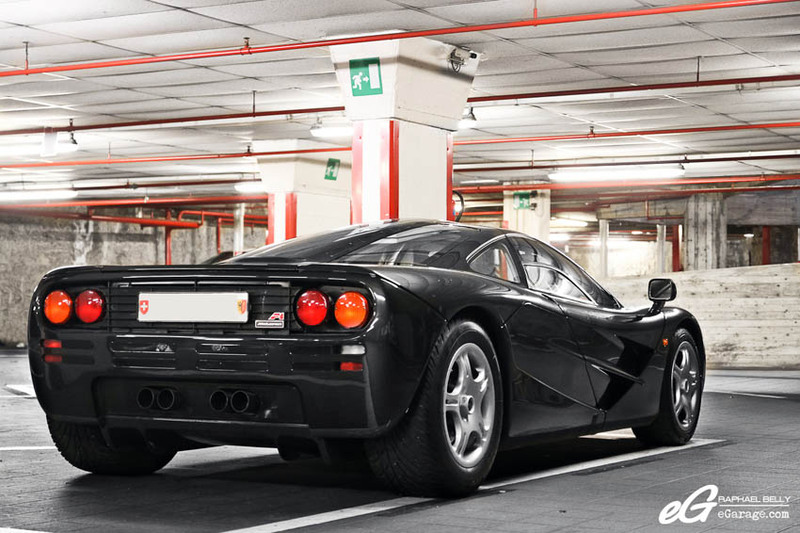 It was really nice to compare it to its “mother”, the Simon Kidston’s McLaren F1, that was in the Villa d’Este hotel parking. Next to the McLaren P1, two Asian concept are catching the eyes : the Nissan Infiniti Emerg-E and the Subaru Viziv Concept. 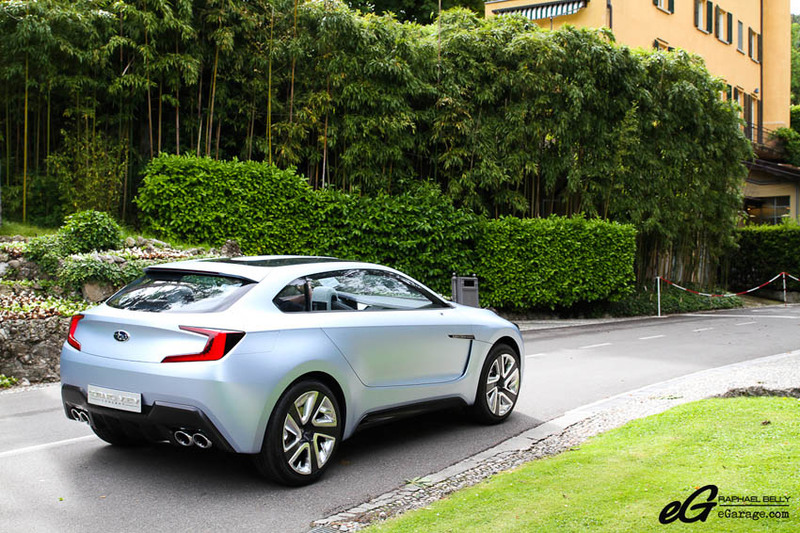 Even if the Nissan Infiniti Emerg-E is a 2012 concept its shapes are really elegant and sporty. 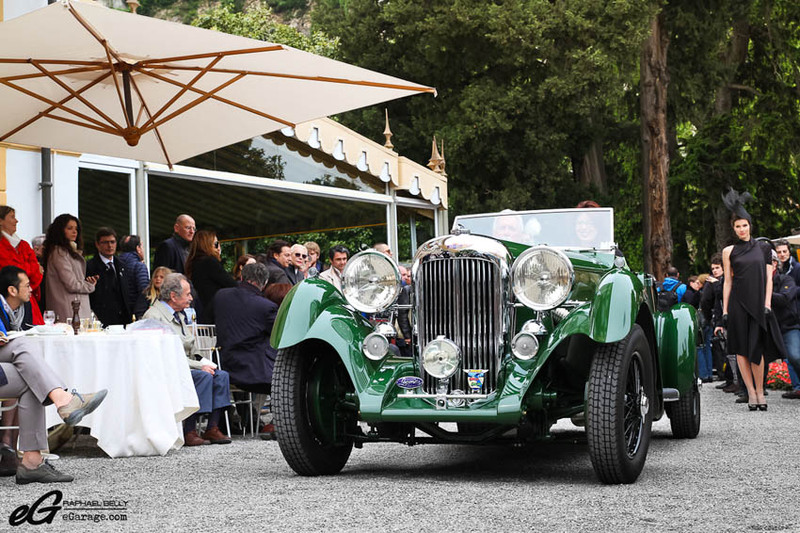 As if the jewels from the Villa d’Este wouldn’t be enough, every two years Concorso d’Eleganza Villa d’Este welcomes RM Auctions at Villa Erba. 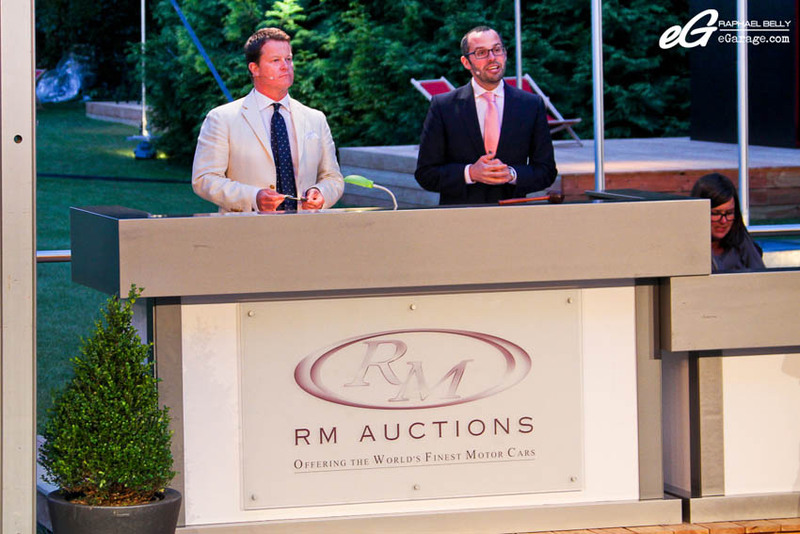 RM Auctions (incorporated in 1991), is a classic car auction company which also does restoration, private treaty sales, auctions, estate planning and financial services. 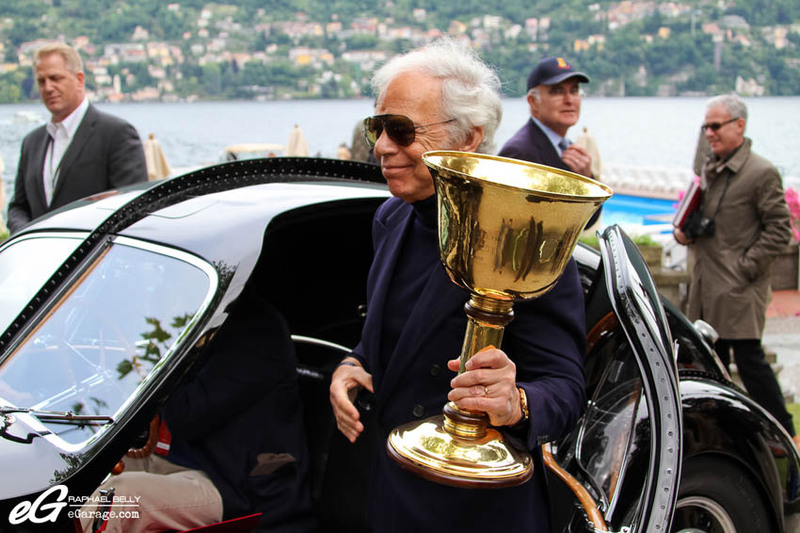 They are auctionning cars during important car event as in Italy (during the Concorso d’Eleganza Villa d’Este), in USA (during Amelia Island Concours, in New York), in Monaco, and in many other countries. 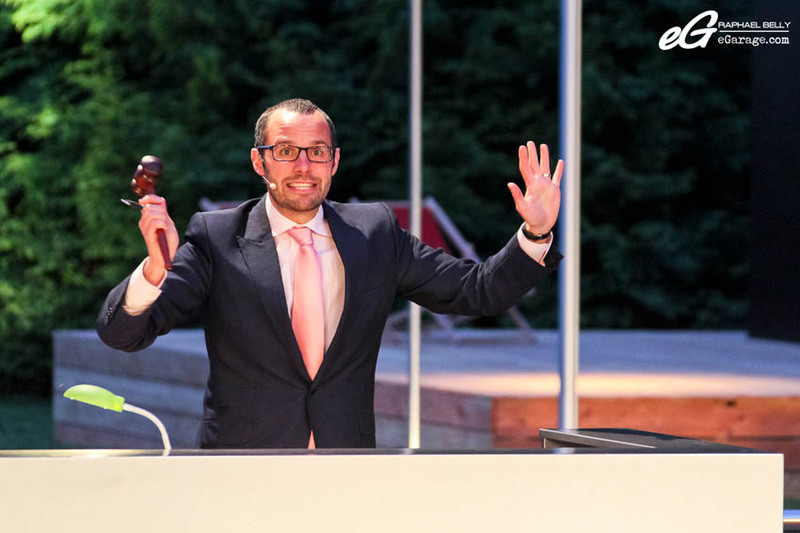 Max Girardo (Managing Director of RM Europe and also RM Auction auctioneer) is a particular character. I’ve been told he has a funny and familiar way to manage the auction but that was the first time I was seeing it in person. And I have to say I had a strict and boring vision of auctions. But he changed my mind immediately as he doesn’t manage the auction in a boring and standard way like you may see somewhere else. He’s always making a lot of moves, he doesn’t stop to speak to maintain the attraction, he plays like an actor. 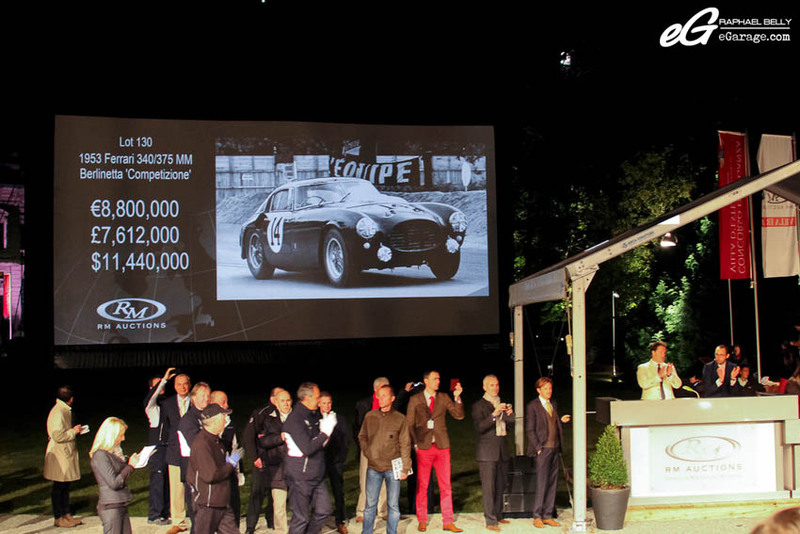 At one moment, a customer bid on a car and then another customer raised the auction by 50,000€. Max came back to the first customer who was hesitating and said to him “Don’t look at your wife, look at me sir, set a 25,000€ plus, just for me, you should do it sir”. I think this a very good way to sell the cars and to forget the stratospheric prices and money in play. 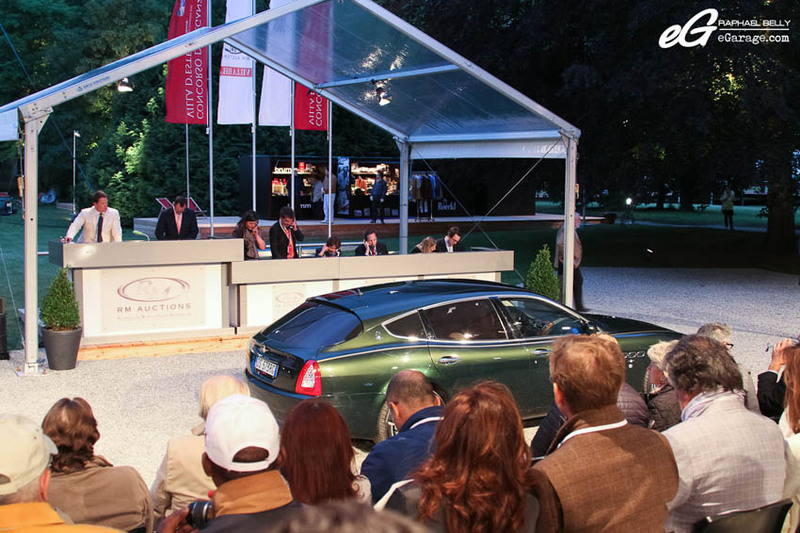 At the end of the sale, 32 cars were sold for a total value of 26,989,600€ (34,789,594$). 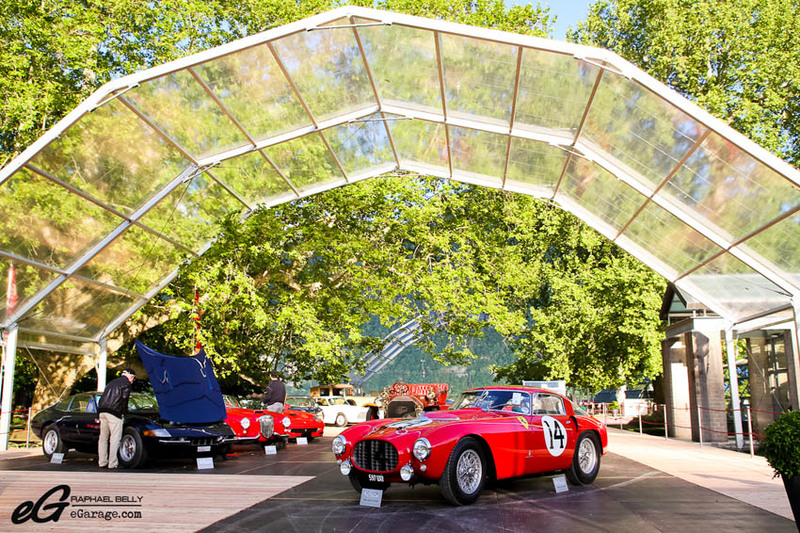 When I walked under the RM Auction dome in Villa Erba and when I discovered all the cars displayed I was really surprised about how many Ferrari there were (16 out of 32 cars!). 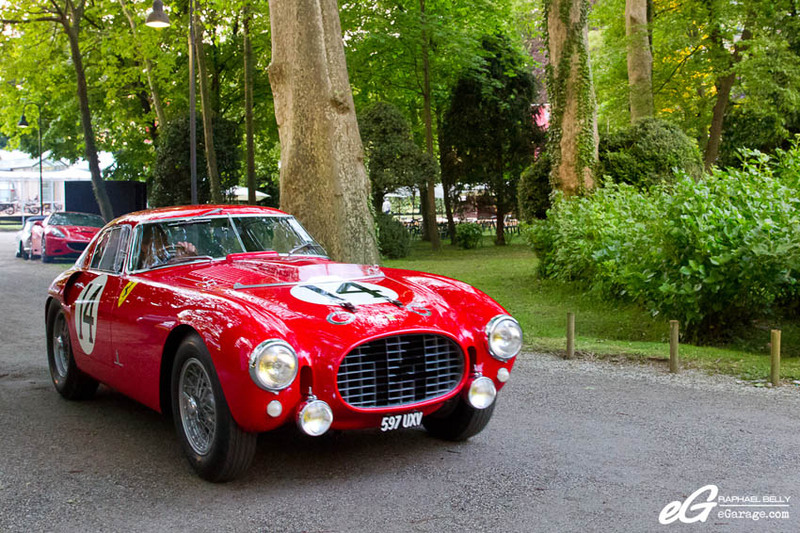 Some cars reached peak price as the incredible 1953 Ferrari 340/375 MM PininFarina Berlinetta Competizione sold for 9,856,000€ (12,812,800$), smashing the previous auction record for the model and establishing a new world record for a closed Berlinetta Ferrari sold at auction. 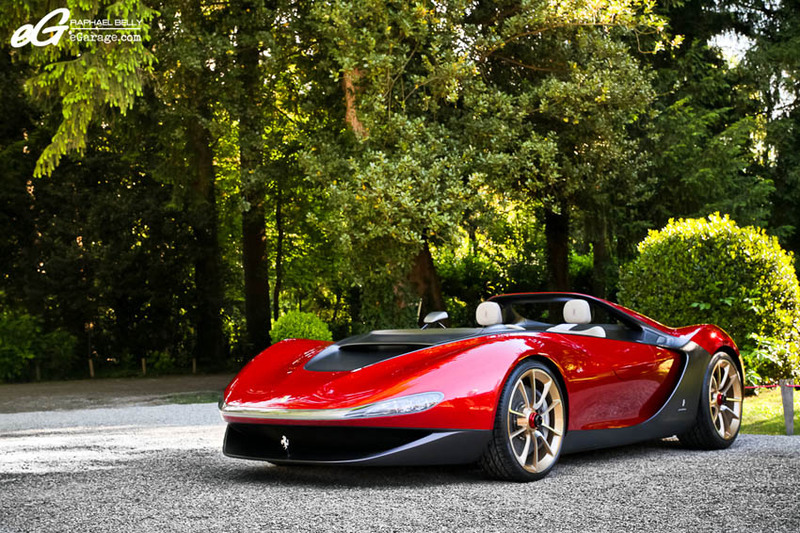 Ferrari was once again the unstoppable brand most in demand by bidders. 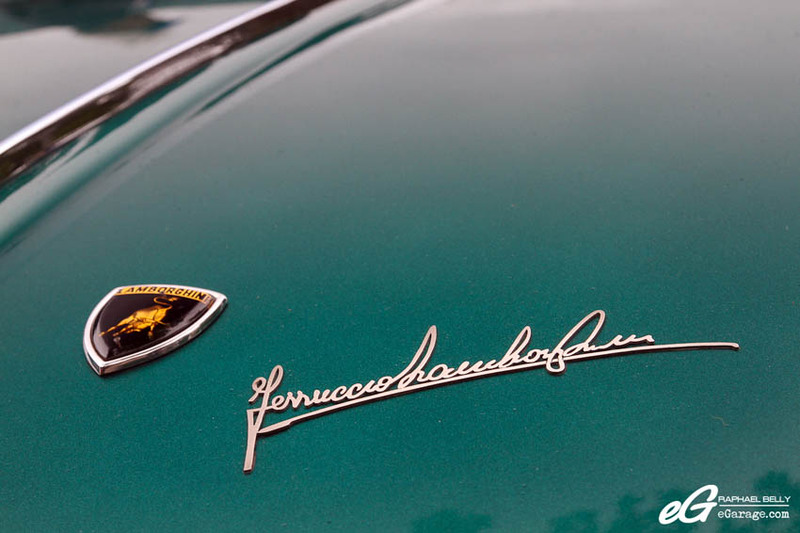 Besides the remarkable performance of the 340/375 MM, other notable Ferrari sales included the 1962 Ferrari 400 Superamerica SWB Coupé Aerodinamico, which realized 2,184,000€ (2,839,000$), the 2004 Ferrari Enzo which achieved 1,069,600€ (1,390,480$), the 1965 Ferrari 275 GTB gone for 1,120,000€ (1,456,000$), and the 2010 Ferrari 599XX which brought 918,400€ (1,193,120$). 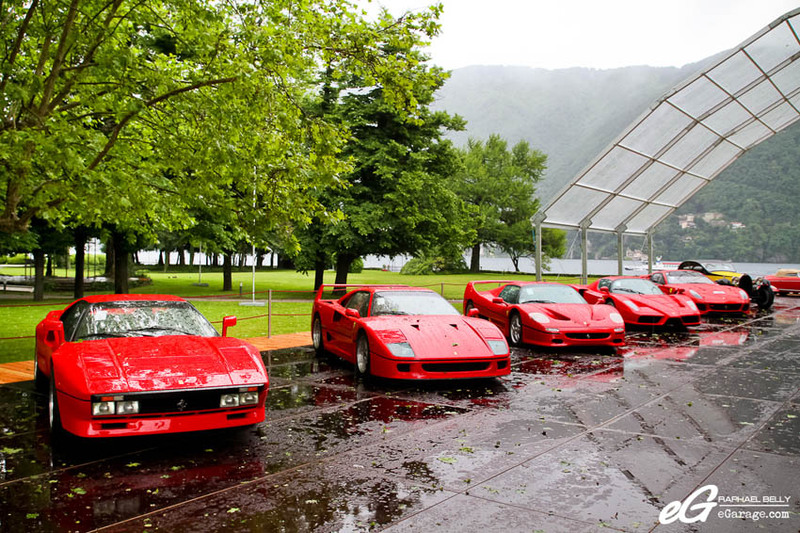 In total, 16 Ferraris were offered at Villa Erba, all of which sold very strongly. The stunning 1962 Mercedes-Benz 300SL Roadster impressed everyone with its immaculate presentation and garnered significant pre-sale interest. 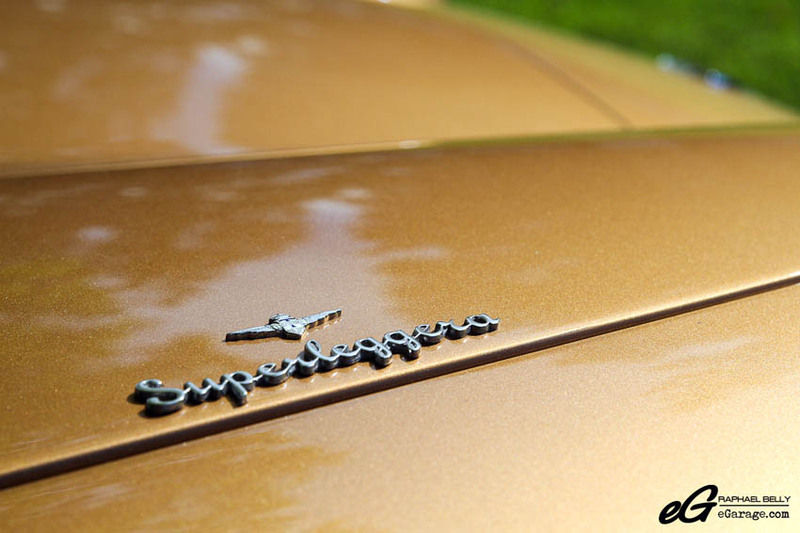 When the hammer fell, the car found a new owner for 1,114,400€, an extremely stong price for a 300SL Roadster ! Amazing classic cars in a charming and luxury place under sweet weather, a very welcoming and kind staff and delicious food, could you ask for more? 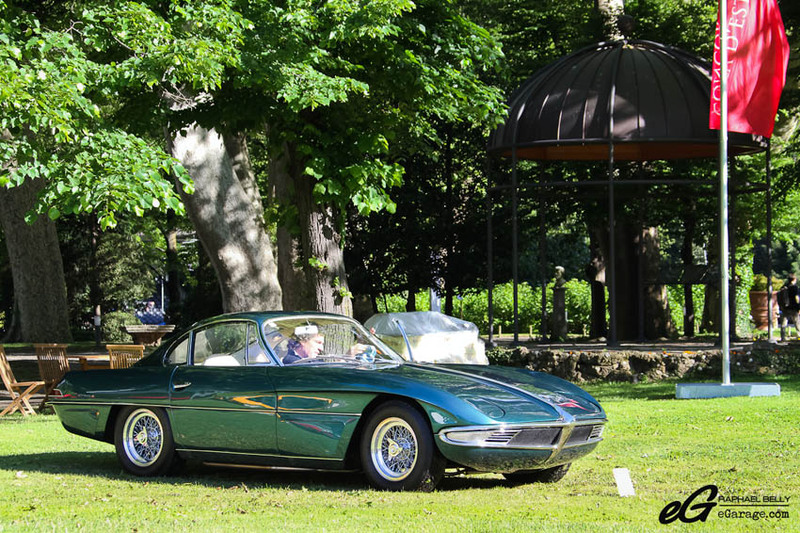 There is a unique mood at Concorso d’Eleganza Villa d’Este, an indefinable atmosphere that even pushes you to put the camera away and sit on a chair while watching the cars and people walk by. 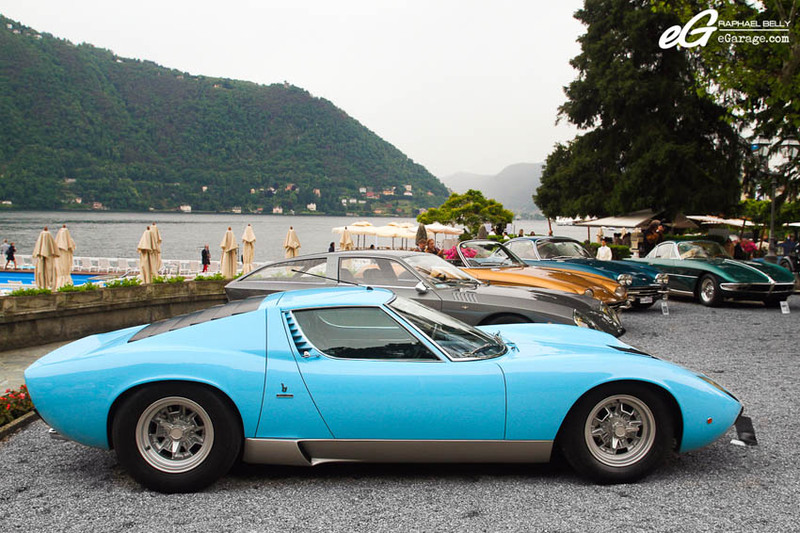 You absolutely need to experience it yourself by going to Villa d’Este, Cernobbio next year in May.